What makes MyNetDiary's mobile apps the best? Ease-of-use and comprehensiveness. Food and exercise tracking is much faster with MyNetDiary, leveraging the same Instant Food Entry and huge food database with over 700,000 foods. MyNetDiary provides top ranked mobile apps for iPhone, iPad, and Android. From any phone, you diary is automatically synced to your online account. You can log mobile or online, or even change your phone or carrier and keep losing weight with MyNetDiary! There are many great things available only in MyNetDiary - fastest and most flexible food entry, PhotoFood service (in Pro and Maximum), awesome Today Widget, and much more. MyNetDiary mobile apps have been recognized by Apple, Google, and by many press publications. MyNetDiary's iPhone Calorie Counter PRO was handpicked by Apple as an App Store Essential for "Get in Shape". The MyNetDiary for iPad is selected as Apple Staff Favorite. Our Android app is every bit as good! MyNetDiary is based on proven science - it's rated as the #1 mobile diet app in an independent study published in the American Journal of Preventive Medicine. The New York Times, comparing to MyFitnessPal, calls MyNetDiary "simpler, quicker... also, it looks nicer." MyNetDiary diet service was developed following proven, scientific, evidence-based guidelines and best practices for dieting and weight loss. MyNetDiary is quite popular with dietitians, nutritionists, and trainers working with their clients using MyNetDiary. To get you started, MyNetDiary provides free professional packs for dietitians, nutritionists, and trainers, please see Food Diary for Healthcare Professionals for more information. If you start regular work with your clients using MyNetDiary, you can purchase discounted memberships for them, which could be enabled for automatic information sharing with you. There are several ways to share your (if you are the patient) or your patient's food diary. 1. There is an option of online, real-time information sharing through MyNetDiary website. The patient/client can use either the website, or one of MyNetDiary's top-rated mobile apps. After enabling information sharing with another person (e.g. dietitian), the other person can see via the website the food diary, weigh-ins, and notes of the client, and they can exchange messages. Please see Sending Friend Request for detailed instructions. 2. If ongoing online access to the food diary is not needed, a patient/client can e-mail PDF reports generated on the website. MyNetDiary website has PDF reports for foods, activities, measurements, diet plan, summary reports, and more. 3. Also, a patient/client can enable weekly summary e-mails and forward them to his or her dietitian or trainer. This is the simplest option. Finally, there is a directory of dietitians and trainers working with MyNetDiary. If you are a professional working with MyNetDiary, you can ask to be included into the directory when you send your credentials for getting the Professional Pack. Of course, you can keep communicating with your client via e-mail or text messaging, sending additional instructions, links and so on. If you would like to provide some instructional videos, we recommend using specialized video services, such as YouTube or Vimeo. 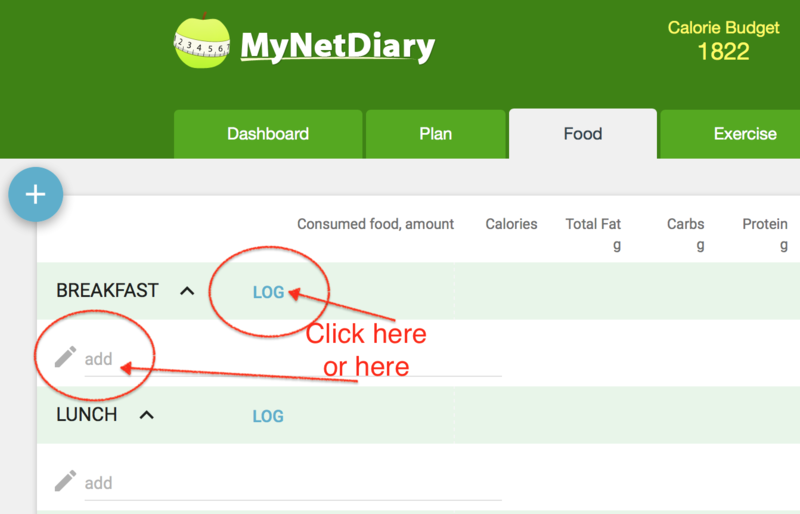 How does MyNetDiary calculate Calorie Budget for me? MyNetDiary uses several formulas to estimate your weight maintenance calorie needs, and then helps you plan your diet based on this estimate. You can plan your diet based on a target weight and date, or on a desired weight-loss rate. If you have a nutrition plan provided by your doctor or dietitian, you can enter it into MyNetDiary, overriding MyNetDiary's calculations. Yes. Keeping track of your calories with a food diary is simple and effective, and it has been proven in multiple scientific studies. Moreover, it has been proven by millions of our members - read some of their success stories on our website. Calories are the bottom line, and MyNetDiary is the best way to track them and help you eat better. What makes MyNetDiary the best online food diary? It's comprehensiveness and ease-of-use. Daily food tracking can take 10-20 minutes on other websites, but only a few minutes with MyNetDiary thanks to our Instant Food Entry - it's like Google instant search, only for foods. We feature a huge food database - over 700,000 foods, and simple, streamlined web pages. Additionally, we offer top-of-the-line mobile apps that automatically sync with our website. Do you have weigh-in meetings? No. For support and motivation you can rely on our active and friendly Online Community from the comfort of your home. You can participate in our forums, supported by a Registered Dietitian, or join one or more groups or teams according to your interests or location. You can participate in the community online or right from the iPhone app. We are working on adding community access to our Android app! How much does MyNetDiary cost? We offer free and paid memberships, from $9 monthly to $60 per year - it's about 17 cents a day! We also provide great mobile apps, which can be used with our web site, or independently. MyNetDiary offers free mobile apps for iPhone and Android. Are you ready to meet your weight goal? Sign up now! Does MyNetDiary calculate WeightWatchers® POINTS®? No, we do something much better and more accurate. MyNetDiary keeps track of calories and individual nutrients from food and calories from exercise to help you eat healthfully and ensure your body gets the nutrients it needs. MyNetDiary provides a daily analysis for saturated fat, cholesterol, sodium, etc, and suggests improvements. Once you found a food in our database (super easy with MyNetDiary! ), the rest is taken care of for you automatically without any effort on your part. Get the whole picture of your nutrition and exercise with MyNetDiary! To help you select most healthful foods, MyNetDiary calculates Food Score, to see at a glance which foods are healthier. What is the difference between having an account and having the app? An Account is needed to sync data entered via the App to the website or to the app installed on another device. Also, it is needed to upload your diary from another device or from www.MyNetDiary.com website to the app. MyNetDiary app can be installed to your device from Google Play or from App Store as any other mobile app. Apple or Google requires installing apps with your Apple ID or with your Google ID. Please notice that MyNetDiary account is not the same as your Apple ID or Google account. MyNetDiary is a modern online diet service. It is comprehensive, easy-to-use and comes with the best mobile diet apps available - on iPhone, iPad, and Android. Why "basic" feature XYZ is not provided for free? Sometimes, we get asked: "Why don't you provide basic feature XYZ for free? Your competitor ABC does!" The problem is that different people are interested in different features and thus consider very different features as being "basic". For some people, micronutrient planning is basic and should be free, for other people - Fitbit syncing should be free, for other people some report or chart should be free. Yet for others syncing with Garmin should be free. Here is the funny thing. There is no Maximum feature in MyNetDiary that someone hasn't requested to be free because he or she considers it "basic"! MyNetDiary's free mobile apps and the website provide many tracking, planning and analysis tools for free, covering all the basics of healthy weight loss. We believe that we provide more tools and features for free than other diet apps and services, such as MyFitnessPal, Livestrong, or Lose It! Moreover, MyNetDiary does not have any ads, sponsored, or promoted stories - neither in the mobile apps, nor on the website. We don't sell our user information to anyone. We want our users to stay focused on their diet, on losing weight, on being healthy - using the best science available, without distracting and frequently misleading ads or promoted stories, trying to sell you something questionable. We provide a good, honest service, we spend a lot of time and efforts continuously improving the apps and the website, adding new cool features, providing customer support to you, but we also have to pay our bills! Thus, we offer MyNeDiary Maximum to our users who want to go beyond the free basics. With MyNetDiary Maximum, we provide many advanced and personalized tools and features for those who want to improve faster, track and analyze more insights, improve health, or get more personalized advice, guidance, and support. We came up with a very reasonable, balanced set of features in free and paid tiers. We don't show ads or promoted stories. We believe our Maximum subscription provides a lot of value, it's very helpful, and it makes you more successful in the long run. Even though today you are interested in just one "basic" feature and feel that the cost of MyNetDiary for this single feature is too high, you are getting much more than this feature with MyNetDiary Maximum. Once you start using MyNetDiary Maximum, you'll find yourself using many more of its features than this one "basic" feature that you are looking for today. MyNetDiary Maximum makes you more successful in the long run. What is the fastest way to enter foods on the phone? Go to a meal (e.g. breakfast), tap the "+" button in the top right corner, which will take you to the Breakfast Entry screen. There, type several words from the food name. As you type, the foods are found and displayed in the list to the right. Once you see the one you need, tap it. The food's full name is displayed below the Food Name Search box, and you will be taken to the Amount box. Type a number (e.g. 2) and tap on a serving size in the list on the right (e.g. "oz"). You'll see calories and weight calculated below the Amount box. Next, tap the Save button, and you'll be taken back to the Meal screen (breakfast, in this example), where you should see the name of the food and the corresponding number of calories. If you want to enter another food, repeat the process starting from tapping the "+" button. MyNetDiary allows to track all kinds of stuff like "bone weight" or "lean body mass". How can I measure them? You can obtain them from a special scale. For example, some Tanita scales provide weight, body fat %, muscle mass, physique rating, and bone mass. MyNetDiary offers free mobile apps and a premium service - MyNetDiary Maximum. MyNetDiary Maximum has the most effective tools to help you lose weight faster and get healthier, this is indeed the most comprehensive diet service you can find. You can purchase MyNetDiary Maximum online on MyNetDiary.com website, or as an in-app purchase from our free iPhone and Android apps. Please go to Settings > Maximum membership page on the MyNetDiary website. You will need to sign in to MyNetDiary with the same account name and password as in your mobile app (if you use one). You can see your account name on the Settings screen in the app, or create account on the Settings screen if you haven't created one yet. After purchasing Maximum online, it will automatically enable all Maximum features in your mobile app. You can also purchase Maximum from MyNetDiary's free apps for iPhone and Android. Purchasing Maximum from a mobile app also automatically enables all Maximum features on the MyNetDiary website. MyNetDiary Maximum is not yet available for purchase from MyNetDiary Pro and Diabetes apps. If you use a paid app and would like to upgrade to Maximum, you have to purchase it online, on our website, as described above. What is the fastest way to enter foods on the website? MyNetDiary is designed from the ground up to make food entry as fast and easy as possible. None of other web sites, free or paid, comes close. Here is a tip for really fast food entry: MyNetDiary searches while you type a food name. Simply click in the food name cell in the food table and start typing. MyNetDiary will display foods found as you type. The search is instantaneous and you don't need to go to any other pages, you can simply keep typing and see the immediate results. Once you see the food you need in the dropdown, you can use the Up and Down arrow keys to select it. Then hit the Tab key to go to the amount cell, enter the amount (any format is supported, e.g. 2, 1.5, or 2/3), and similarly select a serving size with the arrow keys from another dropdown. Hit Tab again, which will take you to the next food row. This way, you don't even need to use the mouse or take your hands off the keyboard. It works really well. What is the size of a "glass of water" in MyNetDiary? Water glasses do not affect any calculations in MyNetDiary, as water consumption does not seem to affect weight loss directly. MyNetDiary provides water tracking because many people want to track it, to ensure they drink enough fluids. You can decide for yourself what glass size is most convenient for you, and re-calculate all fluids you drink into such glasses. For example, you can decide to consider glass size to be 6 fl oz, or 200 ml - whatever makes sense to you, just use it consistently. How do I come up with a good calorie and nutrient plan? Start all over again? It is very easy to create a diet plan with MyNetDiary web app or mobile apps. When you need to adjust your plan over time, you may also find it useful to review our in-depth Calorie planning guide and Nutrient planning guide. Can I have two apps on the same phone? If you'd like to keep track of two food diaries on the same phone, for example, for yourself and for your significant one, or for your child, you can do this on the iPhone. Please install two apps, e.g. PRO and Diabetes and create or sign in to different MyNetDiary accounts. The apps will be completely independent of each other. This way, you won't need to switch between accounts every day. As MyNetDiary has only one app for iPad, you can keep a diary for several people on the same device, but you'll have to switch between account. Alternatively, if you use iPad, you can install one of MyNetDiary's iPhone apps in addition to MyNetDiary HD. A person engages in typical daily living activities (shopping, cooking, laundry, walking a few minutes to and from car/bus/train) but sits for much of the day. Sample occupations: computer programmers, office and phone jobs. Sedentary activities above PLUS 30-60 minutes of MODERATE daily activities (e.g. walks 2 miles at 3-4 mph). Sample occupations: school teachers, cashiers, retail workers, and stay-at-home parents with active children. Sedentary activities above PLUS 60-120 minutes of MODERATE activities (e.g. walks more than 7 miles daily). Sample occupations: restaurant servers, light construction workers, cleaning professionals, and nursing. Sedentary activities above PLUS 60 minutes or more of moderate activities PLUS 60 minutes of vigorous activity (or 120 minutes or more of moderate activity). Occupations: lumberjacks, heavy construction workers, and professional athletes (during their competitive and training seasons). Typically, a gram of fat is considered to be 9 calories, while a gram of carbs or proteins is 4 calories. Using these numbers, a food with 5 grams of fat, 15 grams of carbs and 10 grams of protein should provide 145 calories, calculated as 5 * 9 + 15 * 4 + 10 * 4. For many foods, these "calculated" calories are the same or close to the actual calories printed at the top of food's Nutrition Facts. For some foods, though, the "calculated" calories value may be quite different. There are several reasons for that. Most importantly, calories-per-gram for fats, carbs, and proteins (9, 4, and 4 respectively) are approximate, average values, and vary for different kinds of fats, different kinds of carbs, and different proteins. For example, a more accurate "average" calories per gram of fat value is 8.9 calories. For carbs, calories vary from 3.692 calories per gram for glucose to 4.116 calories for starch. Proteins from meat and vegetable sources are metabolized differently, with greater portion lost as nitrogenous substances in urine and feces for meat proteins, thus caloric effect of one gram of protein is different for them, i.e. it is not precisely 4 calories in all cases. Thus, the "9-4-4" rule, while working well for many foods, may calculate calories different from calories printed in Nutrition Facts. Differences by a few percent are quite regular. Still, if you see values differing by more than 20%, it is worth of double checking Nutrition Facts, to make sure all numbers are correct. These variations of calculated and actual calories may also result in your daily totals of calories and macronutrients not matching planned values. When calculating your diet plan, MyNetDiary distributes total calories planned among macronutrients based on the "9-4-4" rule - that's the best rule available. For example, a 2,000 calories plan with 25% of calories coming from fat, 50% from carbs, and 25% from proteins means that 500 calories should come from fat, 1,000 - from carbs, and 500 - from proteins. These calories are re-calculated into 56 grams of fat (that is 500 / 9), 250 gram of carbs (that is 1,000 / 4), and 125 grams of proteins (that is 500 / 4). If all foods had perfect 9-4-4 calories match, then when you consume during a day 56 grams of fat, 250 grams of carbs, and 125 grams of proteins, your total daily calories would be precisely 2,000 calories. BUT, as we now know, calories may not match for some foods, resulting in a discrepancy - you consume fats, carbs, and proteins as planned, but you miss your daily calories! Or, it could be the other way - you hit your calorie targets, but you may miss on some macronutrients! This is normal situation, caused by one or several foods that have "calculated" calories different from actual, thus causing differences in your planned and actual calories and macronutrients. I have an iPad. What are the differences between MyNetDiary iPhone and iPad apps? Both apps work great on the iPad, they both use the same database, and have almost the same features. The key difference that the iPad app is optimized and designed from scratch for the iPad. The iPad has a dramatically bigger screen, which enabled us to show more information with fewer screens, dramatically reduce the number of screens in the app, reduce number of taps needed to see and enter information, and ultimately make keeping food diary even easier for you. For example, to enter a food on iPhone, you need to tap "Meals", tap the meal you need (e.g. Lunch), tap "Search", and start typing food name. On the iPad, you simply tap the meal row you need and start typing. It's not that the iPhone. MyNetDiary has many options for integration with other services and apps. MyNetDiary provides very robust and comprehensive sync with Fitbit, Garmin and Withings. We are adding Misfit in the nearest future. As MyNetDiary can track food time, it can send more accurate food information to them than other diet apps. When compared to MyFitnessPal, MyNetDiary sends all foods, all nutrients (not just summaries), and also it properly timestamps them. Once you setup the link, you won't have to do anything else, no sync buttons to push, no apps to launch, the sync will be automatic. Your MyNetDiary mobile app will be getting the information, too. You can link MyNetDiary with Fitbit and other trackers on the Settings tab at MyNetDiary website. For an example of the process see Fitbit setup. You can also link from the Settings screen of our iPhone and Android apps. Please note that linking to third-party fitness trackers is included with MyNetDiary Maximum membership, along with many other premium tools and options to help you lose weight faster and get healthier. If you don't have Maximum, you can upgrade online on the MyNetDiary website, on the Pay & Manage page. If you have an iPhone and you don't use another fitness app already, for walking, running, cycling, and hiking MyNetDiary recommends its own GPS Running Tracker app. It is simple and straightforward, helping you get more active and keep track of it. The app automatically syncs with your MyNetDiary account and also shows your current daily totals. MyNetDiary also provides a very comprehensive integration with Apple's Health App, sending foods, measurements, BG and more, as well as importing workouts created by other apps, body weight, step count, blood pressure and blood glucose. Please see iPhone Health App Sync support article for details. If you use Runkeeper, MapMyRun, Endomondo, Human, or some other workout app that can export workouts to the Health App, MyNetDiary will import them into the Exercises screen/section. Please see Runkeeper, MapMyRun, Endomondo sync support article for more detailed workout import instructions. If Health App workouts don't show up in MyNetDiary, please see Troubleshooting Health App Workout Import support article for detailed, step-by-step troubleshooting instructions. 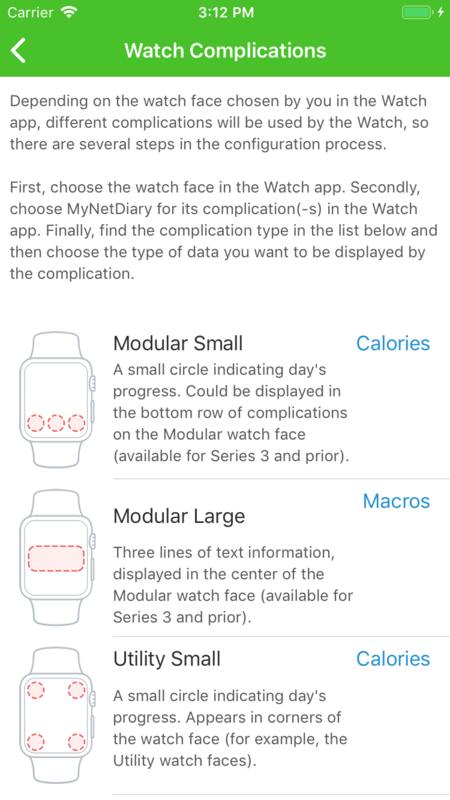 MyNetDiary can import workouts logged with Apple Watch's Activity app. This is done through the Health App - the Activity app from the watch sends workouts into the iPhone Health App, similar to other fitness apps. If workouts recorded with the Watch's Activity app don't show up in MyNetDiary, please see Troubleshooting Health App Workout Import support article for detailed, step-by-step troubleshooting instructions. Can I create a "recipe" from several foods? Yes, we support recipes on the web site and on the phone. Recipes are created from meals, so as the first step, enter all ingredients in any meal (e.g. breakfast or snack). Next, on the web site, use the "Recipe" link displayed in the meal row, in the Amount column. In mobile apps, use the "Recipe" button. Enter a recipe name and then click/tap Save - a new custom food will be created based on the ingredients and will replace the ingredients in the meal. Next time you eat these foods, you only need to start typing your new recipe name. Our mobile apps have recipe editor allowing to add, remove, and change ingredients and also adjust portion information. It's very easy - you can share your log or request sharing your client's log online, on Sending Friend Invitation page. The page provides detailed instruction - please see the screenshot below. Please, note that you both need MyNetDiary accounts, to identify yourself and make sure sharing goes to the right person! If you purchased one of MyNetDiary iOS apps or MyNetDiary Maximum subscription via iOS in-app purchase, it was sold to you by Apple Inc. Our company, MyNetDiary is just one of many app developers providing its software and services to Apple, and Apple is the store selling the goods. The sale is between you and Apple and its terms and conditions are set by Apple, not by us. Unfortunately, Apple does not provide a way for app developers like MyNetDiary to refund your purchases. Like a manufacturing company cannot provide refunds for something you have bought at Walmart, we cannot refund your purchases made at iOS App Store. If you would like to get a refund, you should contact Apple. Their return and refund policies vary country-by-country, so please see their policies specific to your country. As of 2016, in-app purchases made on the US iOS App Store are not refundable by Apple, please see iTunes Terms and Conditions and search (it's a very long document) for In-App Subscriptions. For new MyNetDiary Maximum accounts opened and purchased via MyNetDiary website, we provide full 14-day money-back guarantee and no-questions-asked refunds. Whether you have achieved your goals with MyNetDiary, or decided that you don't need the subscription, you need to cancel it, to stop auto-renewal after the current billing cycle. If you purchased MyNetDiary Maximum subscription on Apple's iOS App Store, we, unfortunately, cannot cancel auto-renewal or provide refunds, as MyNetDiary is just a vendor on the App Store and we don't have access to App Store payments and refunds. Please see iOS App Store Refunds for detailed information. Only you can cancel your subscriptions purchased on the App Store, please see Apple's View, change, or cancel your subscriptions support article for more information. MyNetDiary does not provide pro-rated refunds. While the annual membership is the most economical option, if you are not sure how long you will be using MyNetDiary, then we recommend purchasing the monthly plan. Please note that if you have paid via MyNetDiary's website for a new MyNetDiary Maximum subscription, we provide 14-day money-back guarantee and full refunds, no questions asked. Our support team will issue full refund within 24 hours after you request cancellation if you are eligible for a refund. It may take up to 3 business days to receive your refund. If you paid via MyNetDiary's website for a new MyNetDiary Maximum subscription, we provide 14-day money-back guarantee and full refunds, no questions asked. Our support team will issue full refund within 24 hours after you request cancellation if you are eligible for a refund. It may take up to 3 business days to receive your refund. If you purchased MyNetDiary Maximum subscription on Apple's iOS App Store, we cannot cancel auto-renewal or provide refunds, as MyNetDiary is just a vendor on the App Store and we don't have access to App Store payments and refunds. Please see iOS App Store Refunds for detailed information. Only you can cancel your subscriptions purchased on the App Store, please see Apple's View, change, or cancel your subscriptions support article for more information. If you purchased MyNetDiary Maximum subscription via Google Play, you can cancel it by going to your Google Wallet, please see Cancel a subscription support article provided by Google. MyNetDiary website and mobile apps provide many tools to help people track their carbs, and if needed - blood glucose, medications, insulin, as well as special charts and reports. If you only need tracking carbs, MyNetDiary Pro iPhone app could be a good option. You can plan your carbs, proteins, and fats on the Plan screen in the app. You can also turn ON option "Show Carbs" in app's Settings, which will start showing carbs for each food and meal in the app, during food entry and on other screens. There are special charts showing macronutrients and comparing them with your plan. If you need more than just carbs, MyNetDiary Maximum subscription includes even more comprehensive, special tools and reports. You can select type of carbs you want to track, either total, net, or diabetes carb count. You can track your blood glucose and medications. You can get special reports helping you to see impact of foods, carbs, medications, and exercise to your blood glucose levels. There are many more great tools and features coming with the Maximum, helping you improve your diet and health. Diabetes tools are available with Maximum subscription in iPhone and Android mobile apps, and online at MyNetDiary.com website. The apps and website sync with each other. Cancel or terminate my account? Please note that if you email us, requesting account deletion, we cannot delete account based solely on the email, as emails are not secure and could be spoofed. 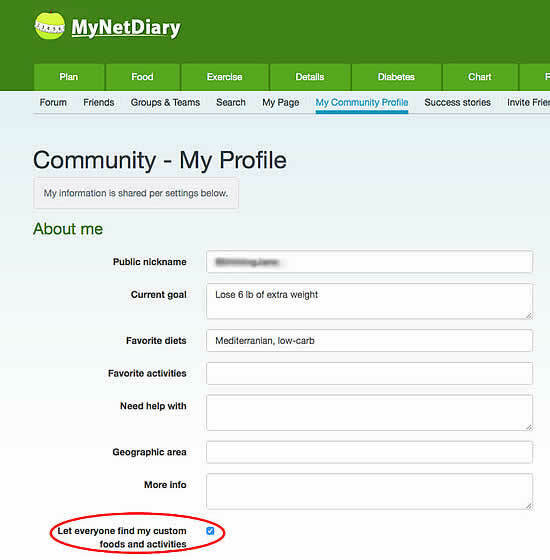 Account deletion could be done only by the account owner, after the owner logs in to his or her MyNetDiary account. If you paid via MyNetDiary's website for a new MyNetDiary Maximum subscription, we provide 14-days money-back guarantee and full refunds, no questions asked. Our support team will issue full refund within 24 hours after you terminated your account if you are eligible for a refund. It may take up to 3 business days to receive your refund. If you purchased MyNetDiary Maximum subscription on Apple's iOS App Store, we cannot provide refunds, as MyNetDiary is just a vendor on the App Store and we don't have access to App Store payments and refunds. Please see iOS App Store Refunds for detailed information and instructions. Please note that terminating MyNetDiary account does not cancel in-app subscription purchased on iPhone - only you can cancel your subscriptions purchased on the App Store, please see Apple's View, change, or cancel your subscriptions support article for more information. If you paid for MyNetDiary Maximum subscription through Google Play and terminate your account with MyNetDiary, we will cancel your auto-renewable subscription on Google Play, so you won't be charged again by Google. Please note that MyNetDiary does not offer pro-rated refunds of subscription purchases. Alternatively, you can cancel your subscription by going to your Google Wallet account, please see Google Play subscription policy for more details. How is Calorie Budget calculated? MyNetDiary uses the official formulas for Estimated Energy Requirements provided by the Food and Nutrition Board of the Institute of Medicine of the National Academies. The formulas are explained in "Energy" chapter of DRI book. PA indicates activity level, and is equal to 1.0 for sedentary, 1.12 for low active, 1.27 for active, and 1.45 for very active. See more details about MyNetDiary activity levels. We recommend selecting activity level in MyNetDiary as "sedentary" and accurately accounting for any extra energy-burning activities and exercises that are outside of typical "sedentary" lifestyle. This will be much more accurate than the generic "active" activity level, which is of course a very rough guess. You can adjust your activity level in Plan section. Once MyNetDiary calculates your body energy requirements, it subtracts from it the daily "deficit" calories to match your weekly weight loss rate. If you plan to lose 1 lb/week, you need to lose 3,500 calories per week, that is 500 calories per day. In this example, Calorie Budget are calculated by subtracting 500 calories from daily energy requirements. MyNetDiary does not consider body fat percentage or BMI for calculating Calorie Budget, as the formulas above are more accurate. You may want to consider normal BMI when you decide what is your desired target weight. How can I set Calorie Budget? MyNetDiary calculates "weight maintenance" calories for you based on your personal data (current weight, height, activity level, age) and target date or weight loss rate. Then, assuming that to lose a pound per week you needed to lose 3,500 calories weekly, MyNetDiary calculates daily calorie deficit needed and subtracts it from the "maintenance" calories. MyNetDiary can calculate calories up to 2 lb/week rate. The reason for the 2 lb/week limit is that if you create a larger calorie deficit then your body metabolism changes and the rule "3,500 calories = 1 lb of fat" stops working. But, while MyNetDiary won't be able to calculate your target calories for over 2 lb/week rate, if you have a doctor's recommendation, you can set target daily calories manually, overriding MyNetDiary's calculations. In mobile apps, you can plan your diet on the Plan screen. If you need to override MyNetDiary's calculations, simply tap the Plan row and edit them. Calorie Budget is possible to customize on My Plan screen. On the website, you can plan your diet on the Plan page. You can also adjust fats, carbs, and protein targets, which will automatically recalculate calories. Each gram of fat is 9 calories; protein and carbs are 4 calories. Some people prefer to reduce fats, some prefer fewer carbs, some reduce fats and carbs proportionally. Also, please, review MyNetDiary planning guidelines on setting calorie goals and nutrient goals. How does MyNetDiary calculate BMR calories? Can I enter my own BMR? MyNetDiary uses Mifflin formula for estimating Basal Metabolic Rate. There is no need to set BMR to a custom value because MyNetDiary does not use BMR for planning and analysis. See also how Weight Maintenance Calories are calculated. I enter my food accurately and I'm under my daily budget but I'm not losing weight. 1. Water weight is suspected if you gained while eating a reduced caloric diet. Weighing oneself first thing in the morning is a good idea to avoid variation due to hydration/time of day. 2. Track sodium - higher sodium the night before often means water retention and a higher water weight the next morning. 3. Track accurately. There might be an error while logging foods or/and exercises. See more about Weight plateau. Understand your caloric goals. Learn about helpful tips if you are new member. 4. Send a question in the "Ask a Registered Dietitian/Diabetes Educator" forum - the first row in the list. 5. Double check again that you are logging foods and recipes accurately. If you create a calories deficit, then you will lose weight. There is a lot of misinformation about this idea that if you don't eat your calories budget, you'll starve and the body will hang onto calories and prevent weight loss. Make sure you are capturing your actual calories. Focus on tightening up tracking. Measure/weigh all foods/drinks you consume. Log basic foods. How can I plan my nutrients? Please review Planning Your Nutrient Needs article explaining how to set up your nutrient targets and track them in MyNetDiary. Also notice that you can plan your week in advance. Just enter your foods for future days, and as your day progresses, update your diary if you ate something else or in a different quantity. Use food time field to distinguish between planned and consumed foods. Food time tracking can be enabled at Account page. 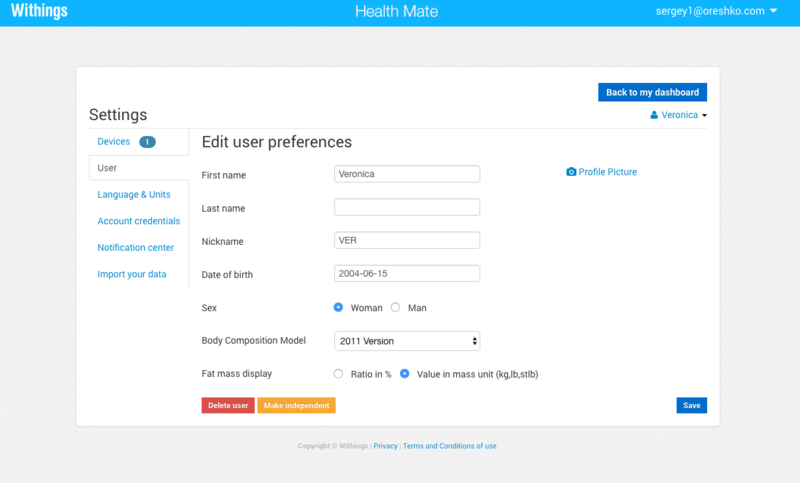 How does MyNetDiary calculate BMI index? Can I enter my own BMI? MyNetDiary calculates Body Mass Index using BMI formula published by Centers for Disease Control and Prevention. By definition, there is only one way to calculate BMI. Any "improved" BMI formulas, for example taking into account muscle mass, are not BMI. They may provide better or worse quantification of your weight and body composition, but they are not BMI. Thus, there is no way to override BMI calculation in MyNetDiary. On the other hand, MyNetDiary does not use BMI for planning and analysis calculations at all. BMI is calculated and displayed for your information only and does not affect anything. MyNetDiary does not require following some specific diet or eliminating some foods, but you can do that if you want to, this is up to your dietary preferences. Some people try to reduce carbs, some try to cut fats. Generally, you want to eat healthy and stay within your nutrition plan setup by you in MyNetDiary to meet your weight goals. You can keep eating your favorite foods, but you may need to do this in moderation, to make sure your nutrition is balanced (see the USDA Food Pyramid guide for additional information about food groups.) In addition, MyNetDiary calculates Food Score for each food, which also helps quickly estimate healthfulness of the food. MyNetDiary has just one section for snacks, but MyNetDiary can track food time, so it can track multiple snacks - morning, afternoon, and so on. Once you enable time tracking in MyNetDiary settings, Food Report in mobile apps will group snacks by time, and even show them in-between different meals. Also, the iPhone app will total calories and carbs for each snack type based on time. This is a very flexible and convenient way to keep track of multiple snacks, without creating many separate snack sections. Entering snack time is simple and easy in MyNetDiary! The Analysis row on the Home screen shows calories remaining per your diet plan, while taking exercise into account, so that you can see quickly how you do compared with your plan. The more you eat (Food is larger), the smaller is Remains. The more you exercise (Exercise is larger), the larger is Remains, exercise increases your calorie budget. If you have entered weekly exercise plan, then Remains will be smaller, since your FoodPlan was already increased during planning (to let you eat more because of the planned exercise, while losing the same number of calories per day.) If you've planned weekly exercise, but don't have it done during the day, you have to eat less, thus Remains would be smaller. If you did not eat much food, but you see a small number of calories remaining in the Analysis row, this could be due to your exercise plan - you need to exercise more! The energy balance provided inside, on the Analysis screen, has more detailed information, going beyond plan and analyzing your current (as they may change with weight changes) maintenance calories, comparing them with foods and exercise and calculating the estimate of actual calories your body lost (or gained) on that day. Thus, the analysis row may be showing that you are meeting your plan, for example, show 100 calories left, but the analysis screen may show that you are actually not losing enough calories, e.g. because you lost much weight and your body uses fewer calories, so the analysis screen would be recommending to burn some calories. In such cases, we recommend updating your weight loss plan, to make sure it is up to date! How is weight loss projection calculated? Is it accurate? MyNetDiary follows the guidelines of the National Institute of Health at www.nlm.nih.gov to estimate weight loss. MyNetDiary recalculates calories lost into weight loss by dividing the calories by 3500, which gives weight loss in pounds. 1. Accuracy of food entry - make sure all foods are entered, and the amounts are estimated accurately. Ideally, you may want to use a food scale, at least initially, to get a better sense how much your typical portions weigh. 2. Food nutritional contents may vary due to varying growth, storage, and preparation conditions. Even if you enter precise amounts, consumed calories may differ from the food labels. 3. Variations in human body metabolism. Due to different body types and difference in muscle mass (lean muscle mass needs more calories than regular body tissues) your actual "weight maintenance" calorie level may differ from the calculated estimate. 4. Variations in daily activities and energy expenditures - the recommended "sedentary" activity level setting represents a statistically average "desk job" activity level, but your day, your job may vary from the average and even for you not every day is the same. Due to these variations and to the fact that when you lose weight you calorie needs are reduced as well, we recommend periodically analyzing your diet and plan on the Plan page. If your progress is slower or faster than MyNetDiary projections, one or more factors listed above might be at work. In such cases, please assume that the projections calculated by MyNetDiary should be adjusted for you. Can I use MyNetDiary to maintain weight? Yes, please read our Weight Maintenance article. The daily analysis helps users stay on track by evaluating user information daily in order to determine whether the user is on target. When the user deviates from target, MyNetDiary expresses the deviation in calories. This allows the user to take an immediate measurable action, e.g. eat less or exercise more, in order to compensate the deviation calories and avoid starving at the same time. How much weight did I lose today? CaloriesDRIis a estimated daily Dietary Reference Intake calories depending on age, gender, weight, height and personal activity level. where ConsumedCalories is the number of calories consumed with food for the day and BurnCalories is the number of calories spend on additional exercise (basic daily activities are accounted by personal activity level). MyNetDiary needs the following information from the user in order to estimate weight loss for the day: personal age, gender, body weight, height, activity level, accurate ConsumedCalories for the day and BurnCalories if user exercised on that day. Estimating weight loss for the day allows MyNetDiary to predict whether the user can achieve target body weight on target date. Both, date and weight, are important components of user target: losing less weight than planned (underachieving) by target date may be frustrating. If NeededCalorieLoss TotalLossCalories for the day (see formula1), then user is on target or is overachieving. Otherwise, the user is underachieving, in which case MyNetDiary gives a recommendation to exercise more by the difference= NeededCalorieLoss-TotalLossCalories, where TotalLossCalories are calculated by formula1. Notice, that the plan is controlled by the user, that is why the estimates calculated with formula2 and formula2a can be wildly different. AutoPilot option tells MyNetDiary to adjust your Planned daily calories, Fats, Carbs and Proteins depending on your Current weight, Target weight and Target date entered at Plan tab, your body Height, Date of birth, Gender, Activity level entered at Account tab and Exercise plan entered at Plan tab. Existing exercise plan is recalculated based on your body weight changes. Selecting AutoPilot option has the same effect as clicking "Reset calories", except "Reset calories" command changes your plan once, while AutoPilot keeps adjusting your food and exercise plan whenever you enter new body weight or change any data mentioned at Plan page. Notice: While relying on AutoPilot, please, make sure Target date is far enough. AutoPilot cannot guarantee achieving target weight timely when target date is too close or desired weight loss is too great for the period till target date. Under those extreme conditions AutoPilot switches to a safe 1 lbs/week strategy. AutoPilot feature requires Maximum membership. Binge eating disorder is a real thing and many people suffer from it. If this is something you do regularly, and you feel out of control, then look for a binge eating support group run by a professional. Therapy counseling is the primary treatment for binge eating. The roots go deep in terms of why we binge. If you think that food tracking could be making the binge eating worse, then stop using MyNetDiary (or any tracker). If you want to try losing weight without tracking then you could focus on healthy meals, no skipping, with a simple balance. Is there a time in the evening you shouldn't eat after? No, there is not a set time at night to stop eating for weight loss. The bottom line is calories. You should be fine as long as you meet your total daily calories target. But having said that, anyone who suffers from reflux (GERD) or heartburn should avoid eating heavy snacks (e.g. high in fat/protein) before bedtime or lying down. Shift workers have a challenge if the majority of their calories are consumed in the middle of the night. Generally, they do better with smaller, more frequent meals, and movement to help them stay alert. How to change my goal for weight loss? It's possible via the Plan screen. The Plan icon looks like a target circle for archery. What do I do if I just keep going over the calorie intake but if I don't, I feel hungry? 1. Lower your rate of weight loss so that the calories deficit you need to achieve is lower. That will provide a more reasonable calories intake target. 2. Enter an exercise plan so that the system increases the target calories by the expected daily exercises calories burned. Entering actual exercise each day will update the calories target in Daily Analysis. 3. Learn the tricks for feeling more full on fewer calories. What are MyNetDiary recommendations based on? MyNetDiary recommendations for calories and nutrients are based on "Institute of Medicine Dietary Reference Intakes (2005)" book available online and in print ISBN 0-309-08525-X. For nutrient recommendations see DRI tables with Recommended Dietary Allowances, Adequate Intakes and Upper Levels. For calories recommendations see EER formula. Recommendations for some nutrients like Vitamin D were updated by the scientists after the book was released. MyNetDiary uses the latest DRI tables obtained from the National Academies of Sciences, Engineering, and Medicine. The micronutrients are established by the Institute of Medicine for age and gender categories to cover all levels of calories within those groups. They are not specific for a defined calorie level. Why the budget is that high for maintaining a stable weight? The issue is that different devices and products use different equations for estimating calories expenditure. For example, 1500 calories for an estimation of BMR (or RMR) would still be significantly lower than MyNetDiary sedentary activity level because they are not the same or equivalent measures. The different apps and activity trackers use different equations. MyNetDiary uses the DRI energy equations - you can check out the online chapter if you want to geek out a bit. There are three types of foods in MyNetDiary: contributed, system and custom types. It is important to understand quality difference between 571,000 high-quality system foods and 296,000 so called "contributed" foods. Contributed foods are the copies of custom user foods, which are selected and beautified by automatic algorithms, then saved to the food database so that everyone can find them while logging foods. For example, after entering "heinz ketchup" foods you will see food names with "(contributed)" suffix. Please, notice, that contributed foods do not go through the rigorous verification process applied to system foods in the food catalog. Contributed food have anomalies in nutrient data, there are duplicated foods, misspellings and abbreviations in contributed food names etc. Any MyNetDiary user can improve contributed food definition. This is why the quality of contributed foods improves over time and approaches the quality typical for system foods maintained by MyNetDiary team. If you do not want to see contributed foods among the search results, please modify "Contributed foods" option at Account page. Also, notice, that this option does not affect your custom foods, which are always searched along with the system foods. MyNetDiary Diabetes allows users to find system foods and create custom foods when needed. Contributed foods are hidden from MyNetDiary Diabetes users. What is Food Score / Grade? Food Score indicates a food's relative healthfulness compared to other similar foods. It is intended to help you make healthier selections within categories of foods (e.g. pick the healthier breakfast cereal). Food Score is a single number calculated from multiple nutrient values found on Nutrition Facts. The higher is the Food Score, the better. Food Grade is a letter representing Food Score range: A, B, C or D. Please read Food Score article for more details. Home-made recipes? Finding only restaurant foods! MyNetDiary food database has many popular home-made recipes, but it could be difficult to identify them. If you are not looking for the best possible accuracy, it's OK to select from search a food that sounds like what you are making, even if it is prepared food. Don't eat much and keep tracking, don't let this stop you! If you are looking for the most accurate tracking, we recommend entering your own recipes. The reason is that there is a great variety of cooking instructions and ingredients for every kind of meal, with greatly varying portion sizes, calories, and so on. For example, there are so many "Chicken Stew" recipes! It may be difficult to figure out if the recipe found in MyNetDiary is the same as you are making. You can create your own recipe very easily in MyNetDiary, it's a one-time investment that you'll use again and again. Enter all ingredients in some meal (e.g. dinner) in full quantities - the amount you use for the entire meal. Tap or click "Recipe" button, enter your personal recipe name, e.g. "Susan's Chicken Stew"
Enter the number of servings that you enter ingredients for, e.g. "4 servings". Select Food Group and save the recipe. The new recipe will replace the ingredient foods in your meal. You may need to adjust the number of servings you ate (for example, if you entered ingredients for 4, but ate only 1.5 serving). The next time you cook this recipe, simply search by name and enter the number of servings! If you need to edit the recipe, simply log this food in your diary as the usual, then on the Food Entry screen (in mobile apps) tap the Edit button. Keeping text notes in the "Vitamins & Supplements". This is a screen in mobile apps and a box on the website. This is easy and informal. If you would like to keep most accurate track of all daily vitamin and micronutrient totals, you can log your vitamins as regular foods, so they will be included in daily totals. 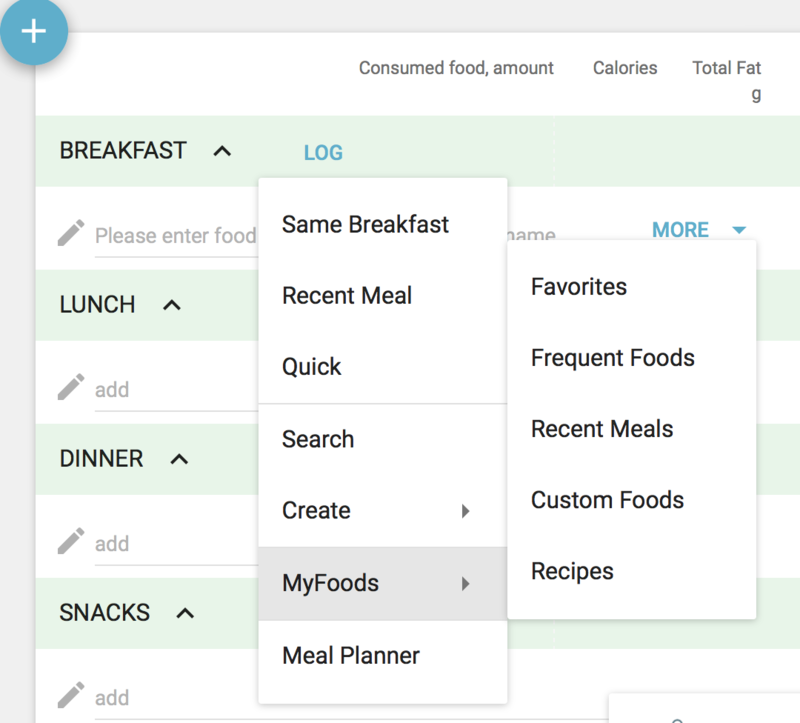 As with any regular food, you need to find your tablets in the food database (there are many of them there), or create them as custom foods (with zero calories), then you can log them as foods. As with any foods, if you frequently consume several foods together, for example take multi-vitamins and calcium supplement every morning, you can make it a "recipe", so the next day you'll only need to log one "recipe" food. As vendors introduce new foods and modify composition of existing foods, some foods might be missing from the food database or become out of date. With MyNetDiary, on Android, iPhones, iPod Touches, iPads with camera, you can send us food and nutrition label photos directly from the app. We will add or update the food and enter all nutrients for you! We strive to process foods in 24 hours. You can access PhotoFoods from the Food Label screen to update an existing food (use the "Update" button in the top right corner), or from Custom Food screen when you are entering a new food. When you use PhotoFoods, please make sure you searched for the right food. If you send us photo of what you ate, but the food you selected in search does not match, we would not be able to update its nutrients - it's a different food and that would make its nutrients wrong. When you are sending us photos, please make sure that there is no such food in the database and that you selected the right food in search! Also, you can turn PhotoFoods off on the Custom Food screen and enter all nutrients yourself, if you prefer to do this yourself. See also PhotoFood help page. What if I do not find food in the database? First of all, you can find and use a similar food. It's OK to log a similar food, the most important thing is to keep tracking, eating better, and you will be losing weight! But, if you are looking for most accurate tracking, read on, there are many options in MyNetDiary! If you are using a mobile app, the best option is to send us PhotoFood request - a photo of packaging with food name and a photo of its Nutrition Facts. We typically process PhotoFoods within 24 hours, entering all nutrients for you. PhotoFoods are available in MyNetDiary's paid apps and also with MyNetDiary Maximum. Please use the Custom Food screen with PhotoFoods option ON. Alternatively, you can create your own custom food and enter all nutrients yourself. Enter the food name, the serving, optionally, weight and the nutritional information as it printed on the label on the package. You can also create a new custom food as a recipe based on existing foods as ingredients or simply create a new custom food from scratch while performing food entry. Custom foods and recipes can be created from phone, from iPad or the website. It is also possible to create a custom food by copying an existing food at the web site: select the food in food table, click "Food Details" button, then click "Copy and customize" link. Finally, you can find and copy other users' custom foods via Community Search. How do I delete a custom food? Go to Food page and click "My Foods" link. Select the food you want to delete, then click the Delete button. MyNetDiary can create recipes on the website and in mobile apps. Recipes are created from meals, so as the first step, enter all ingredients in any meal (e.g. breakfast or snack). Next, on the website, use the "Recipe" link displayed in the meal row, in the Amount column. In a mobile app, tap the "Recipe" button. Finally, enter a recipe name and select food group, and then click/tap Save - a new recipe will be created based on the ingredients and will replace the ingredients in the meal. Next time you eat these foods, you only need to start typing your recipe name. If you ever need to edit the recipe, you can open an existing food entry of this recipe (the last day and meal you logged this recipe), then click or tap "Edit". Please note that editing a recipe affects previous food entries with this recipe. If you've made a mistake creating the recipe, you would want to fix it and update previous records. In this case you do want to edit the recipe. In other cases, if you are deciding to start cooking this food differently (e.g. using light mayo instead of regular) you would not want to change change your prior records, but only use this from now on. In such cases, you want to create a new, similar recipe with different ingredients and a different name. How big is the "serving"? Some foods in MyNetDiary food database have only one serving type listed, without weight information. It could be "sandwich", or "cookie" or just "serving". This means a typical amount of this food. This works well for a sandwich or cookie, but could be unclear for "serving" - how big it really is? If serving weight information is unavailable, most likely it was not published by the food vendor. MyNetDiary would not be able to figure this out. We recommend finding a similar food that has weight information, or creating a custom food, if you have Nutrition Label. You can also use PhotoFoods to get this entered for you! How may I enter a portion size that isn't there? MyNetDiary shows all the serving sizes provided by the food vendor and all conversions possible. If the vendor provided serving weight, you can enter weight in grams or oz. Use a food scale when possible, as this will be the most accurate! If the vendor provided a volume information, e.g. "cup", MyNetDiary will list all other volume units, e.g. "ml" or "fl oz". If you don't see a certain serving size, MyNetDiary won't be able to figure it out. If this serving size is published in the Nutrition Facts, you can send us a PhotoFoods request - we will update the food and this serving size will become available. You can also create your custom food and use it immediately. Another option is just to estimate amount in another units, e.g. its weight - it's OK to enter approximate amount, just keep tracking your foods! The recipe-builder function has a "serving" field. What you enter here depends on ingredient foods you have in this recipe. If you entered foods for one serving, you should enter "serving" or whatever the serving is, e.g. "cup", or "2 cups". If you entered foods for many servings, i.e. the whole recipe, you should put the total number of servings in the recipe. For example "6 servings" or "12 cups". When you log in your diary this recipe food, e.g. in dinner, you can enter the number of servings you actually ate, e.g. "1.5 servings" or "2 cups" (depending on the actual serving you entered while creating the recipe). MyNetDiary will calculate calories and nutrients based on recipe's serving. You can share custom foods you've created in MyNetDiary with your family members and other people, so that they don't need to re-enter full food labels of these foods. After enabling food sharing, other community members (including your family members) will be able to search by your community name online at Community Search page, go to your Personal page and copy your custom foods to their food catalogs. Custom activities can be shared similarly to custom foods. I noticed retired foods in my diary! MyNetDiary Food Catalog changes over time, which reflects changes in food industry: vendors buy and sell food brands, companies change name while growing the business and introduce new product flavors. While improving Food Catalog, MyNetDiary research team removes obsolete foods from database and marks these foods as retired. If you want to enter the same food again, use the same words to search for the new food replacing the retired one. When you delete a custom food, MyNetDiary retires this custom food similarly to system foods. Does the weight listed show nutrition facts for uncooked or cooked food? 1. For products that are purchased in their unprocessed form in packages (e.g. dry rice or pasta), the serving size on the food label refers to the uncooked product unless otherwise stated. 2. Ideally, log the amount of food in the form actually consumed as well as select the correct food item (raw vs. cooked). Most of the generic foods from USDA (all consumer trackers use USDA as the base from which to grow) include both raw and cooked versions of foods. For instance, I typically eat medium grain brown rice so I log "rice brown medium grain cooked" using the cooked amount consumed. I don't really care which brand it is since it's a basic unprocessed food - USDA data is actually the most complete in that case. Sometimes, USDA's naming conventions are tricky - especially for animals. For instance, when I log my skinned rotisserie chicken leg, I use the the food item: "Chicken broilers or fryers breast meat only cooked roasted." You can learn more about tips for food logging in these posts. 3. Some foods simply don't have a cooked version and you are stuck with entering the raw amount. In that case, do the best that you can in terms of logging the raw or uncooked portion that eventually makes the cooked amount you consumed. I do this for processed foods especially since I want to capture the sodium, sugar, and fat content. In the past, MyNetDiary allowed using custom recipe feature for both their custom recipes and custom meals. To see the custom meal components in their meal log, members could choose "ingredients to meal" so that they saw each ingredient (or meal component) in their food log. The problem was that people would use the "ingredients to meal" option for regular custom recipes and get really confused. Because of this, MyNetDiary team created a new "custom meals" feature, that is separate from the "custom recipe" feature. This way, when we log a custom meal, the meal components automatically get loaded into the food record. So, for example, if the user makes a custom meal containing espresso, Kashi cereal, milk, and banana, then when the user logs that custom meal, the user will see each meal item in the food log. This makes tweaking the amounts of each meal item easy and fast. The custom recipe feature stays the same, except now user doesn't have the option of saving "ingredients to a meal." This is good since members won't make the mistake of choosing this option and then seeing their homemade chili recipe load as 20 separate items. MyNetDiary is US-centric. Some popular branded items may be on the top instead of generic unbranded items. However, you may find the article on finding basic, non-branded foods helpful. MyNetDiary is currently working on the naming convention so that basic, non-branded food items will appear towards the top of the list when searching for food. By the way, it is already implemented on the iPhone App and on the Android App. We call it Staple Foods. The feature can be accessed via the three-dot menu on the top-right corner of the particular meal screen, (e.g. Breakfast or Lunch screen). In the meantime, reading the post four tips on how to find basic foods such as fruit, veggies, meats, fish, poultry, and raw vs. cooked grains and pasta will hopefully be helpful. What is food short name? The idea behind keeping what you typed is that you are giving your short name to the food you are looking for and have found. Many foods have pretty long names, and when you search, you are using the words that are natural for you, they are effectively how you name the food. With this approach, we save a lot of screen space (in mobile apps and on the web site). Also, short names are easier to scan and read. We typically recommend giving "definitive" food names (i.e. searching/typing sometimes an extra word or two, to make the resulting food name unique for you). For example, if you always eat the same kind of hot dogs, typing "hot dog" is sufficient, but if you eat different kinds of hot dogs, e.g. beef franks and pork, such as "Oscar mayer wieners beef franks hotdog wiener frankfurter hot dog" and "Frankfurter pork hot dog frank wiene", you might want to type "beef frank hot dog" and "pork hot dog" respectively, although "hot dog" will be sufficient in each case. Again, in our opinion, this is easier on the eyes and fits nicely into the available screen real estate. When you want to see complete food name, move cursor over short food name: you will see the full name in a little popup and on the right side in "Input description" box. You can also clean your short food names via "My foods" online. How to create or edit my foods (recipes and custom foods)? On the website (Modern Look), you can do this via My Foods section. Then, select either Create or My Foods option. Technically, this action is possible only between two MyNetDiary Free Apps, or between two MyNetDiary Pro Apps, or between two MyNetDiary D Apps. See the details. To protect your privacy, the sync is OFF initially, you have to open "iOS Health App Sync" from MyNetDiary app's Setting screen and turn it on. If this is the first time you enable sync, your iPhone will prompt you with a large list, and you have to turn on the items that you are interested in. Make sure to tap "Done" after you are finished! MyNetDiary sends most detailed information - each food and each nutrient (up to 30 nutrients). We recommend enabling time tracking in MyNetDiary Settings, otherwise MyNetDiary will send breakfast foods as eaten at 8am, lunch - at 12pm, snacks - 3pm, and dinner - at 7pm. Besides foods and nutrients, MyNetDiary can export to the Health App your exercise records, body weight, blood pressure, and blood glucose readings. Please note that BP and BG tracking is provided only with MyNetDiary Maximum. If you have two MyNetDiary apps installed, for example, Free app and Pro app, make sure you enable sync in only one of them, otherwise both apps will send updates to Health App, creating duplicates. These data can be added to the Health App by other fitness apps. The workouts and steps data can be also added to the Health App by Apple Watch. If Health App workouts don't show up in MyNetDiary, please see Troubleshooting Health App Workout Import support article for detailed, step-by-step troubleshooting instructions. If you own an Apple Watch and use built-in Apple Watch app to track your workouts, such as running and walking, you can get these workouts imported into MyNetDiary automatically. As workouts recorded with Apple's app are automatically loaded into the Health App on your iPhone, all you need to do is to enable import of workouts from the Health App to MyNetDiary. Go to the MyNetDiary's Settings screen, select "iOS Health App Sync", turn on sync, and when prompted turn on the desired data types, most importantly - allow import of workout data. If you don't get prompted, go to the Health App, then to Source, locate MyNetDiary and allow the data types you want, making sure to select import of workouts. Please notice that MyNetDiary imports workouts for the 7 days. Apple Watch can record workouts without the iPhone nearby and send them to the Health App when connected. Currently, Apple Watch won't be sending distance, also accuracy will be reduced as it needs to be connected to the iPhone during workout to use its GPS. If Apple Watch workouts don't show up in MyNetDiary, please see Troubleshooting Health App Workout Import support article for detailed, step-by-step troubleshooting instructions. MyNetDiary app can be configured to import daily steps counted by the iPhone with M7/M8 motion co-processor, as well as Apple Watch (through the Health App), or wearable activity tracker. Please go to the Settings screen in the app to select daily step source. The iOS Health app can store two kinds of calories expended - Resting calories and Active calories. Any app can write this information. Hypothetically, it may seem that it is possible to add daily Resting calories to Active calories and thus calculate the total daily calories expended, similar to what an activity tracker like FitBit or Jawbone UP does. Unfortunately, there are two problems with this: 1) different apps interpret and thus calculate Active calories differently (they use different definitions and numbers for regular "not-active" calories). In other words, we don't know the number that active calories should be added to, it's specific to each app and it's not known. 2) None of the apps work well as a full-day activity tracker, keeping track of all of your Resting calories. Even Apple Watch does not calculate and does not provide Resting calories, only Active calories. Thus, there is no reliable source of Resting calories that also provides Active calories. Thus, MyNetDiary keeps relying on estimated Daily Maintenance Calories calculated based on your weight, height, age, gender and activity level. This number already includes your typical daily activities, such as preparing food, shopping, cleaning, walking around. Once again, some of these are considered being Active calories by apps and MyNetDiary using Active calories would have resulted in double counting. MyNetDiary adds only "Workouts" - clearly, explicitly specified "extra activities" beyond your typical daily living activities, such as running, gym exercises, and so on. In the future, when a reliable source of resting and active calories becomes available, it could be used by MyNetDiary, but we are not there yet. More body measurements or more trackers? If you would like to track additional body measurements or some other information important to you but not built-in into MyNetDiary, you typically would be able to track this with custom trackers, which are available in MyNetDiary Maximum. Hunger level - ten values from 1 (overstuffed and bloated) to 10 (starved). Bristol stool tracker for bowel movements. Anything else you may need! Online on the MyNetDiary website, custom trackers are available on the Trackers web page. In mobile apps they are available on the Trackers screen. You can customize tracker name, units, target value and color for charting. How do I track medications? You can track medications on the website and in mobile apps, this is one of many features of MyNetDiary Maximum, helping you lose weight faster and get healthier. You can customize your medication list and track quantity of medications taken (e.g. number of pills) and record time when you take them. To enable medication tracking, you need to enable Diabetes and Health Tracking in MyNetDiary settings. If you don't have Maximum, you can upgrade online on the MyNetDiary website, on the Pay & Manage page. Can I select which nutrients I want to track? Online, you can select nutrients on the Plan page. Use the "Edit other nutrient targets" link in the "Other Nutrients to Track" section. In mobile apps, you can select nutrients on the Meals screen. Besides regular nutrients, MyNetDiary Diabetes supports tracking of net carbs and diabetes carb count. We recommend selecting only the most important for you nutrients, so that they fit into the screen. MyNetDiary always tracks all nutrients, selected or not, and you can see all of them on the Report page. Also, see MyNetDiary's guidelines and recommendations on nutrient goals. Among many other things helping you lose weight faster and get healthier, MyNetDiary Maximum provides "Custom Trackers" - you can track anything with them, including symptoms, test results, food hunger score, life events, allergies, anything - to help you find events, correlations, trigger foods and so on. Here are just a few examples of using custom trackers: allergy symptoms, ketones test results, food satiety, recording sick time (when you stop losing weight), water ounces, blood oxygen (O2) saturation, sleep quality, bowel movements. 1. Create a new custom tracker, for example with name "Allergy", with target value "1", tracker units "intensity", and 0 decimal places. It's a good idea to make a comment in the tracker about the value range you will be using, e.g. "My allergy symptoms, from 1 to 10". Optionally, if you expect to use this tracker frequently, you can move this tracker higher up among other trackers. 2. Once you saved your new custom tracker, you can start tracking it! Go to the tracker and enter current value - the intensity of current symptoms in this example. You can also time stamp it, and even assign a label for further classification (this is optional, though). 3. Keep tracking your symptoms over some time, then you will be able to review them on Day Parts (Diabetes Overview) screens/reports, or chart them in Charts, review for any correlations, and hopefully seeing improvements! Can I use metric units and European date format? On the web site, open the Account page. You can customize many international settings, including units, date format, timezone, etc. The changes will be applied to both the website and the phone app. You can still enter information in any unit, regardless of your defaults. MyNetDiary provides a robust sync with all Garmin wearable activity trackers and other devices that upload data into Garmin Connect website. Depending on your device, MyNetDiary can download your exercises, daily steps, daily step calories, and hours of sleep. Garmin exercise appearing in MyNetDiary do not include your basal (BMR) calories, only calories burned during the exercise. MyNetDiary can import workouts from iOS Health App, so it can import workouts that were recorded by other fitness apps into the Health App. To setup sync, first configure the fitness app to export workouts to the Health App, following the app's instructions. Then, after a workout, open the Health App, go to the Fitness, and check Workouts, to make sure they are indeed exported and available in the Health App. Next, enable Health App sync in MyNetDiary by going to the MyNetDiary's Settings screen and selecting "iOS Health App Sync", turn on sync, and when prompted turn on the desired data types, most importantly - allow import of workout data. If you don't get prompted, go to the Health App, then to Source, locate MyNetDiary and allow the desired data types, including workouts. MyNetDiary allows to specify minimum workout calories for import, by default it's 50 calories. If you would like to import workouts with fewer calories, please adjust the minimal number in MyNetDiary Settings. MyNetDiary imports workouts for the last 7 days. When calculating your diet plan, MyNetDiary distributes Daily Food Calorie Budget among macronutrients. One gram of fat is considered to be 9 calories, while a gram of carbs or proteins is 4 calories. For example, a 2,000 Calorie Budget with 25% of calories coming from fat, 50% from carbs, and 25% from proteins means that 500 calories should come from fat, 1,000 - from carbs, and 500 - from proteins. These calories are re-calculated into 56 grams of fat (that is 500 / 9), 250 gram of carbs (that is 1,000 / 4), and 125 grams of proteins (that is 500 / 4). Thus, when you adjust your macronutrient targets, MyNetDiary will apply the last two macronutrient targets you set, and then adjust the third macronutrient in order to meet your Calorie Budget. If you would like to set specific target values for fats, carbs, and proteins, first you need to set your calorie target to the proper value calculated from macronutrients with gram of fat worth of 9 calories, gram of carbs or proteins worth of 4 calories. Then, when you enter first two macronutrient targets, MyNetDiary will set the third macronutrient to the value you want while meeting your Calorie Budget. Please use the Plan section for customizing macronutrient targets. MyNetDiary tracks up to four meals - breakfast, lunch, dinner, and snacks. If you eat more meals and would like to track them, you can do this by turning on Track Time option in MyNetDiary settings. You would be able to keep time of each food, so if you have several snacks a day, they'll have different timestamps. Daily reports will show snacks grouped separately based on timestamps, in-between main meals. Also, the iPhone app will show snack carbs separately grouped if you have "Show Carbs" option on. or to erase weight history. The old foods, exercises, daily notes and the other records remain. If you want to start the completely brand new diary from scrtch, reinstall the mobile app and create a new account. Optionally, terminate the "old" account via the website. But, we would recommend just to update your target date, target weight, target calories and to continue your existing diary. That's it! MyNetDiary works great for weight maintenance and special diets, including pregnancy and breastfeeding. You can customize your calorie targets per your doctor's recommendations online or in mobile apps. You can also customize macronutrient targets - fats, carbs, and proteins. With MyNetDiary Maximum you can customize and keep track of all of your vitamins and micronutrients - up to 45 nutrients! If you use a tracker, like Fitbit, it can also help you balance calories in MyNetDiary. There are much information and tips about pregnancy or breastfeeding in MyNetDiary Community. MyNetDiary is working to provide special support both pregnancy and breastfeeding planning. In the meantime, you can follow guidelines of the Institute of Medicine: postpartum breastfeeding 0-6 months need extra 330 calories per day, 7-12 months is 400 calories per. You can add breastfeeding as an exercise (no kidding) to account for spending these extra calories. These calorie numbers are totals per day, so you can enter this "exercise" once per day. Make sure to drink plenty of fluids and do not forget to join our Community to ask questions and get support! How do I reset my targets? 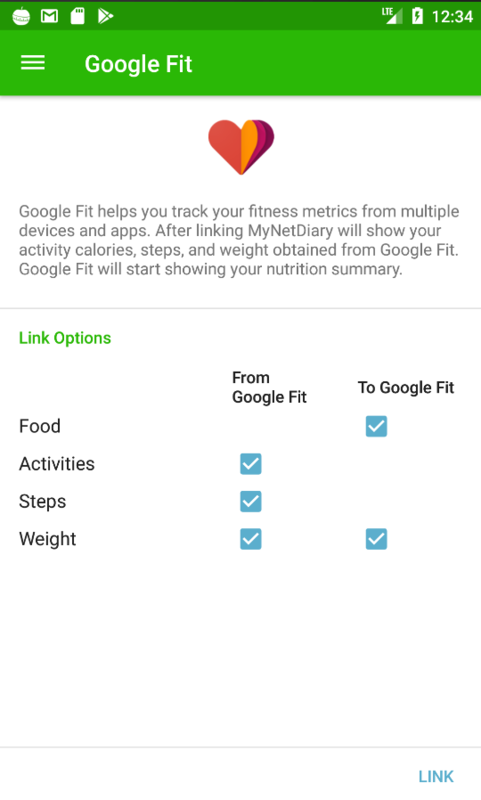 MyNetDiary can sync foods, nutrients, weight, exercise and more to Google Fit app. To protect your privacy, the sync is OFF initially, you have to open "App & Devices" from MyNetDiary app's Setting screen and link to Google Fit. Enable syncing of the desired trackers from list. Besides foods and nutrients, MyNetDiary can export to the Google Fit your body weight records. If you have two MyNetDiary apps installed, for example, free app and Diabetes app, make sure you enable sync in only one of them, otherwise both apps will send updates to Google Fit App, creating duplicates. These data can be added to the Google Fit App by other fitness apps. The workouts and steps data can be also added to the Google Fit App by compatible devices. Why calculated Calorie Budget becomes less than my BMR? The Calorie Budget (Dashboard) or Daily Food Calorie Budget (Plan section) might be lower than one s BMR depending upon which settings are used and how much weight loss per week is selected. MyNetDiary used to use a 1200 calories floor for Calorie Budget, but that made the tracker less useful for people who have had bariatric surgery, or for those following special diets (like the protein-sparing modified fasts). The most common reason why the Calorie Budget ends up being lower than a person's BMR is when they choose to lose 2 lb/week and do not account for exercise. When a person chooses a slower rate of weight loss, and/or accounts for exercise, then the Calorie Budget is brought up to a more reasonable level. While linking to Garmin, it's possible to download Wearable Activity Calories and Wearable Exercise. Wearable Exercise are different to Wearable Activity Calories. Wearable Exercise is a workout tracked while using Garmin's stopwatch. Wearable Activity Calories are showing up in the Exercise section as Garmin Daily Steps record. This record reflects your additional calories burned beyond Activities records in Garmin, for example calories you have burned while walking. Garmin mobile app calculates and displays all calories burned above Resting Calories as Active Calories. These Active Calories include Garmin's Activities (already imported into MyNetDiary exercises). MyNetDiary additionally subtracts from Garmin's Active Calories the expected number of active calories for your Sedentary activity level in MyNetDiary, to include only calories you burn beyond expected and avoid double counting. After subtracting Activities and expected calories, MyNetDiary will create Garmin Daily Steps Calories exercise record. For example, if you see in Garmin 856 Active Calories and two Activities with 100 and 200 calories, and MyNetDiary expected 420 calories typical for your weight and height, then MyNetDiary will create Garmin Daily Steps Calories with 136 calories, calculated as 856 - 100 - 200 - 420. We are considering adding a field for noting common allergens or gluten in the case of Celiac. MyNetDiary's database does not contain allergen data simply because there is so much missing data and it would require manual entry for over 600,000 verified food items. Then there would be the time to update all food items as brands change their recipes (and sometimes have more or less gluten in them). The idea of having a blank field attached to each food item for special customized tracking purposes is in our todo list. But, this feature is not a high priority at this point. We agree that the ability to track allergens would be a fantastic feature. In the meantime, use Daily Notes. Some of our foods contain gluten-free keywords in the name. The good resource for identifying foods with and without gluten is Celiac.org's Gluten Free Marketplace. They have a web page as well as an app. We hope that at some point, we can offer the ability to track allergens, even if by manual entry by the member. In the meantime, you can copy and customize the particular item from our database and add gluten-free into the name of your new custom food. It sounds like you have figured out that your necessary calorie level for weight loss is lower than the estimated calories determined by the equation from the Institutes of Medicine. The equations are simply estimations and we all have our own unique metabolism. You can just override the calorie level by going into Plan and changing it to your custom calorie level. The article about calorie planning may also clarify it. Enabled Wearable Activity Calories can be shown in the Exercise section as Fitbit Exercise record. This record reflects your additional calories burned beyond Activities records in Fitbit, for example, calories you have burned while walking. Fitbit mobile app calculates and displays all calories burned. Resting Calories and extra active Calories are shown there as Daily Total Calories Burned. Fitbit Total Daily Total Calories Burned imported into MyNetDiary. But, they are shown in Exercise Notes only. To calculate Fitbit Exercise, MyNetDiary subtracts DRI (Weight Maintenance calories) from Fitbit Daily Total Calories Burned. This number of active calories is calculated according to your activity level. The value includes only calories burnt beyond expected. This is needed to avoid double counting. After subtracting DRI expected calories, MyNetDiary creates Fitbit exercise record. 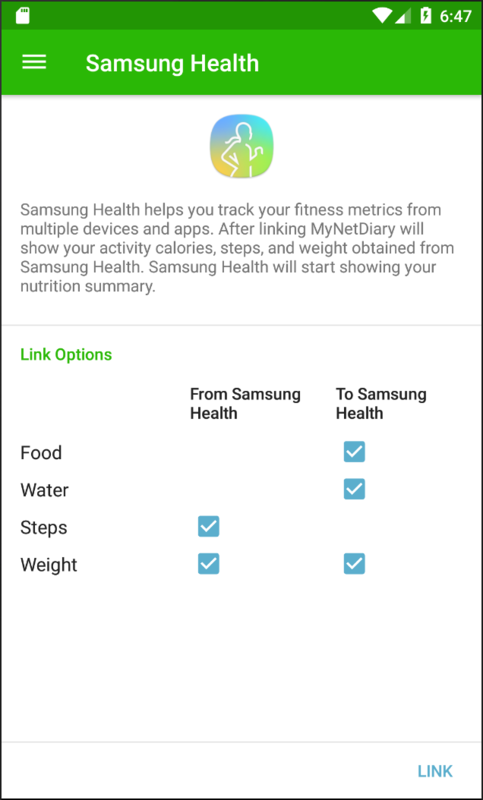 MyNetDiary can sync foods, nutrients, water, weight, steps and more to Samsung Health app. In the future, we are planning to add 'workouts'. For the technical problem, we cannot expose integration for both MyNetDiary apps: free and diabetes. Sync enabled on two apps may send duplicated records to Samsung Health. So, sync was implemented on the Free App only. It's available on the version 6.9.0. To protect your privacy, the sync is OFF initially, you have to open "App & Devices" from MyNetDiary app's Setting screen and link to Samsung Health. Enable syncing of the desired trackers from list. MyNetDiary sends most detailed information - each food and each nutrient (up to 30 nutrients). We recommend enabling time tracking in MyNetDiary Settings, otherwise, MyNetDiary will send breakfast foods as eaten at 8 am, lunch - at 12 pm, snacks - 3 pm, and dinner - at 7 pm. These data can be added to the Samsung Health App by other fitness apps. 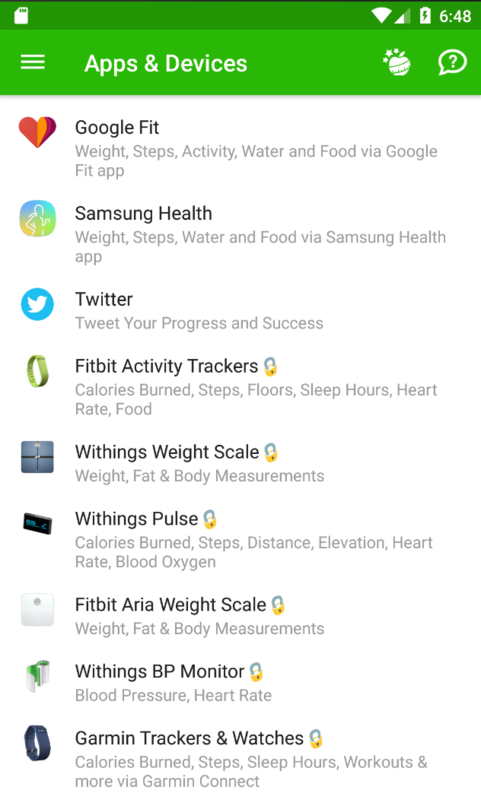 The steps data can be also added to the Samsung Health App by compatible devices. How to change Apple Watch complication logo? A complication is not an adornment of a watch face (i.e. not a cute icon), it is meant to display some information that the watch user deemed interesting for him or her. MyNetDiary can display different data, depending on 1) the watch face the user has chosen in the Watch App and 2) on complication data to display chosen in MyNetDiary app settings. Find the members's nickname in Community (you can use the Community Search box and pick "people" in drop down box). Change your attitude from "neutral" to "friendly"
Go to your own "My Community Profile"
If fiber is less than 5 grams, it is not subtracted. If sugar alcohols are less than 5 grams, it is not subtracted. Also please notice that as sugar alcohols were added recently to MyNetDiary, we are still working on populating the food database with available sugar alcohols information. Sugar alcohols not being available for some foods may result in higher DiabetesCarbCount values. Net carbs are no longer recommended for tracking based upon research that revealed that certain types of fibers and sugar alcohols could affect blood glucose. Diabetes self-management education and training centers use this method of carb counting, especially for those who need to match their short-acting insulin to their mealtime carbs. What are Net Carbs in MyNetDiary? Net carbs in MyNetDiary are calculated as Total Carbs minus Fiber and minus Sugar Alcohols. Please notice that net carbs are no longer recommended for tracking based upon research that revealed that certain types of fibers and sugar alcohols could affect blood glucose. Also please notice that as sugar alcohols were added recently to MyNetDiary, we are still working on populating the food database with available sugar alcohols information. Sugar alcohols not being available for some foods may result in higher Net Carb values. Can I track net carbs, sugar alcohols, and diabetes carbs? Yes, you can select them for tracking in MyNetDiary if you use MyNetDiary's Diabetes Tracker app or upgraded to Maximum membership. Sugar alcohols were added recently, and we are still working on populating the food database with available sugar alcohols information. MyNetDiary's blood glucose tracking tools are meant for regular BG measurements, up to several dozen measurements per day. All tools in MyNetDiary for storing, displaying, reporting, and charting BG values are designed for these relatively small numbers of measurements per day. Unfortunately, connecting Continuous Glucose Monitoring (CGM) to MyNetDiary via iOS Health app is currently not supported and may result in slowdowns and even crashes of the app. We do plan to add to MyNetDiary special CGM tracking and reporting tools in the future. Please bear with us. In the mean time, if you have connected your CGM tools to write into iOS Health app, please turn off in the Health app BG import by MyNetDiary. Foods not found with Diabetes tracking! MyNetDiary implements food label safety rules for Diabetes users, which may result in finding fewer foods after search by name or barcode scan. Contributed Foods may have anomalies since they are entered by the users without verification. The safety rules apply for system foods as well as contributed and custom foods. When a food is not found in the database, we recommend creating a new custom food. Contributed foods are still available for users who do not have diabetes and have set Diabetes type to None at Account Diabetes page. Make sure Find Contributed Foods option is turned on at Account Personal page. MyNetDiary allows to set several reminders for the day. This provides maximum flexibility, while avoiding annoying you with non-relevant reminders, as you may eat at different times on different days. For post-meal checks, MyNetDiary allows to configure prompts to set BG check reminders, making it very easy to set a reminder whenever you ate. If you eat at the same time every day, for pre-meal checks we recommend using either repeatable alarms in iPhone's Clock app, or iPhone Reminders. They are very flexible and reliable and for pre-meal checks there is no sense in duplicating repeatable reminder functionality in the Diabetes app. MyNetDiary supports multiple target blood glucose ranges. For example, you can have different target ranges for fasting, for pre-meal, 1-hour after meal, 2-hours after meal, "before bed" readings, and so on. You can assign one or more labels to a target BG range. For example, if you are following American Diabetes Association's guidelines, you may want to have a target range with values between 80 and 130 mg/dl for "before meal" readings, so you will assign "Before Breakfast", "Before Lunch", "Before Dinner", and "Before Snack" labels to this range. So, when you log a BG reading with label "Before Breakfast", it will be evaluated against this range, and displayed in red for low or yellow for high values outside this range. If some BG reading does not have any labels assigned, or labels assigned don't have target ranges, MyNetDiary will use "default" target range 60-120 mg/dL. If the reading is below 60 mg/dL, it will be highlighted in red. If the reading is below 60 mg/dL it will be highlighted in red, if above 120 mg/dL, it will be highlighted in yellow. MyNetDiary provides two options to track diabetes and other health conditions. 1. Full-featured, comprehensive online and mobile diabetes tracking is included with MyNetDiary Maximum subscription. You get all diabetes tracking, charting, and reporting features on the website. (So, you will be able to print reports and charts and save them. Reports can be saved in PDF, XLS, CSV format, charts in PDF.) If you would like to track with a mobile app on the go, you can download a free MyNetDiary mobile app; once you sign in with your Maximum account, all diabetes and other Maximum features will be unlocked in the app. 2. For people interested in mobile tracking only, MyNetDiary provides a low-cost option - special diabetes tracking apps for iPhone and Android. Mobile diabetes apps don't require having a subscription. In addition, as a courtesy to our diabetes app users, online food and exercise tracking on the website are included for free. Should you decide that you would like to use all the website features, you will need to upgrade to MyNetDiary Maximum. GI and GL help make better carb selections, but interestingly, the research does not show that using GI or GL as a tool improves A1C% in those with diabetes. Also, it's impossible to get GI values into MND's massive database, as well as the fact that most foods do not have a GI value - only a smaller subset from databases. Reviewing and updating GI values become complicated issue as those smaller research databases get updated. Carb counting is the most effective way to control carbs at meals and snacks and given that the tracker does it well. Even though MyNetDiary Diabetes Tracker does not provide Glycemic Index and Glycemic Load, the most important diabetics tool are covered. Recently, there was a change so that if any of these values are missing, MyNetDiary gives that warning and does not show the value. To avoid seeing this in the future, when you enter your custom food, be sure to enter all three. If it is obvious to you that there are no sugar alcohols or fiber grams, then enter "0" in that field. If all 3 values do not present, diabetes carb count or/and net carbs is not being calculated. For example, most of the restaurant foods have only caloric info. So, an accurate "diabetes carb count"/"net cabrs" is not possible. How to go back to the Classic Look of the Food page? On iOS8 and later, MyNetDiary apps come with a special "Today Widget", which could be added to Today's view to quickly see calories remaining, jump to meals, use Food Check and scanner, and even log water - right there in the widget! In the Diabetes app, the widget will also show your average BG, next reminder, and quick logging button. The widget does not show up in Today's view automatically, you have to "edit" it to include MyNetDiary's widget. Pull down your phone's Today view - you need to swipe down from the very top of your phone's screen. You should see Today view (it's your phone's view, not a screen in MyNetDiary) as on the screenshot below. Scroll to the very bottom and tap "Edit" button. Tap little green "plus" button next to MyNetDiary and then drag MyNetDiary in the list where you want it to be, hopefully close to the top! The screenshot below shows location of the "Edit" button, adding the widget to Today's view of your phone. The Today Widget will start working once you log some food! MyNetDiary can import steps from iOS Health App, from a connected wearable activity tracker (such as Fitbit, Garmin, Jawbone UP, Withings), or allow manual entry. MyNetDiary can import steps from the Health App, where they are logged by iPhone itself (using M7/M8 motion co-processor), another fitness app, or by Apple Watch. Make sure you enabled Health App sync in MyNetDiary settings and also allowed MyNetDiary to read step information from the Health App! If you still do not see steps count on the mobile app and on the website, please double-check that "Daily Steps" tracker was enabled in Measurements Settings. if you have connected MyNetDiary to Fitbit, Jawbone, Withings or Garmin, MyNetDiary will download steps for you automatically (along with other information). If you are a MyNetDiary Maximum subscriber, you can also turn on Step Bonus calories, which automatically logs walking exercise for you, more accurately estimating your daily calories in/out balance. Please see Step Bonus - Your Reward For Moving More blog post for more details! Step Bonus calories appear in Exercise section. The feature is enabled when user logs daily steps manually. It's disabled when user gets steps data from activity tracker, from iPhone M7/M8 step counter or from iOS Health app. Make sure your iPhone has iOS 8.3 or later. Do a workout, record it with the other fitness app or Apple Watch. Open the Health App on your iPhone, go to Health Data tab, then Fitness, then Workouts and confirm that you see in the Health App the workout you just did. Make sure Health App sync is enabled in MyNetDiary: in the MyNetDiary app go to the Settings screen, then "iOS Health App Sync" screen, then turn sync OFF (if it was ON) and then back ON. If you get prompted to allow access, make sure you allow MyNetDiary to read workouts. After you've done successfully all the steps above, you should see the workout imported into MyNetDiary the next time you open MyNetDiary app. Please note that MyNetDiary allows to specify minimum workout calories for import, 50 calories by default. Some health apps, such as Human record every movement as a small workout, often with 3, 5 or 10 calories, resulting in dozens and hundreds of such "workouts" per day. The minimum workout calories setting in MyNetDiary allows you to skip such "workouts". If you see workouts in the Health App with fewer calories than the minimal calories setting in MyNetDiary app, these workouts will not be imported. If you would like to import workouts with fewer than 50 calories, please adjust the minimal number in MyNetDiary iOS Health App Sync setting's. Also, please note that MyNetDiary imports workouts for the last 7 days. Finally, please note that importing daily step count from the Health App (including steps recorded by Apple Watch) is different from workout import. Imported step counts are stored as Measurements. With MyNetDiary Maximum, you can also enable "Step Bonus" calories, to adjust your allowed daily food calories. If barcode scanning does not work on your iPhone or iPad, there could be several possible reasons, please follow the troubleshooting steps below. Make sure you have internet connection, as the scanner uses online lookup. Sometimes, after app update, barcode scanner stops working for a mysterious reason until you reboot your phone. If you updated the app recently and barcode scanning simply stopped working, please try rebooting your phone. If on opening MyNetDiary app you get prompted with sign in name and password dialog, you need to enter them, as the scanner uses online lookup. If you don't remember your password, please reset password online. If you are still having troubles after going through all the steps, please send us a support request, we would love to help you, but we need to learn more details about the problem from you! In a recent update of the iPhone app we've added a long time requested feature - "Quick Calories", allowing to quickly log calories only, if you don't have time to lookup the food in the database. You can log "Quick Calories" by using a new "flame" button in the bottom of meal screen. To make room for this new button, we had to move "Recipe" button to the "Food Menu" popup. This menu is located on the top right corner of the particular meal screen (e.g. on the Breakfast screen.) The Food Menu lists all the entry options, including recipes, custom foods, copying foods, and more! Touch ID stopped working after update! Sometimes after app update, the app may have issues with accessing privacy-related features of the phone and Touch ID could stop working. From our experience, this happens very rarely, odds are less than 1%, but you could run into this, too. Please try restarting/rebooting your phone and the issue goes away. If you are still experiencing problems, please send us a support request, we would be glad to help you! As of June 24, 2018, www.jawbone.com is no longer working and, as the result, MyNetDiary link for Jawbone UP trackers stopped working, too. Since June 19, 2017 Jawbone Inc has been undergoing liquidation, and although it was promised that its products will continue working, Jawbone Support acknowledged service disruption on May 27, 2018, and it is no longer working since then. As the result, MyNetDiary has to discontinue support for Jawbone UP trackers. For our users with Jawbone UP, we recommend migration to Fitbit, Garmin, or Withings trackers. You can enable it via the Settings screen of the App. If you see discrepancies between distance you walked or ran and what is calculated by the GPS tracker, please try turning off Auto Pause, as it may detect pauses incorrectly. Also, running in a city or under trees sometimes may result in the app losing GPS signal and messing up your route. Please keep an eye on the GPS signal strength indicator in the top right corner, it should not turn yellow or red. If you run into other problems with GPS tracking, please send us a support request! Our mobile apps work great without Internet connection, they only need Internet connection during initial setup, and then for online barcode lookup and for charting. When offline, they use a smaller, streamlined food database, and will use the full 659,000 when online. All apps sync your diary to our servers, giving you access to the huge food database that is always up to date, providing an option to access your diary online from a regular computer, and to restore your diary if you lose your phone or get a new phone. If you have an existing MyNetDiary account, you can sign in to use this account from the Settings screen in the app. If you installed MyNetDiary app on your iPhone without creating an account from the app, and now you attempt to sign in to an existing MyNetDiary account from the app, then the app will ask which diary you want to continue. You can continue with diary data you currently have in the app, or you can continue with the diary data you currently have in the existing online account. Case #1 - continue diary in the app. If you have most of the diary in the app and not a lot in the existing online account, then you should continue with the diary in the app. This situation occurs when you kept diary in the app for some time, then created a brand new MyNetDiary account online, and then purchased MyNetDiary Maximum subscription. Now you want to continue diary in the app, but also have access to all features of Maximum. In this case, select the option to continue diary in the app. Your app diary will be continued and you will be signing in both in the app and online under the existing online account name. Case #2 - continue diary of the existing online account. If you kept a diary online or in the app, and then recently re-installed the app without signing in to your existing account, in this case you want to continue diary of the existing online account. The current diary in the newly re-installed app won't be moved over. The app will be continuing the diary that you have online; you will be signing in both in the app and online under the existing online account name. Why nutrients totals do not match? MyNetDiary displays nutrient amounts rounded to the nearest integer. To calculate most accurate totals, MyNetDiary sums all the nutrient amounts and only then rounds, thus avoiding possible rounding errors and sometimes arriving to a different total. For example, if in your breakfast you logged three foods with actual carb nutrient values 3.2g, 4.2g, and 5.2g, the values will be rounded to the nearest integer and the foods will display 3, 4, and 5 grams of carb respectively. But the breakfast total will be calculated as 3.2+4.2+5.2 = 12.6 and thus rounded to the nearest integer - 13 grams. So, while it may look that the totals are incorrect (if you expected to see 12 grams), they are actually calculated most accurately. MyNetDiary uses the same rules for daily totals, summarizing all nutrient values first and then rounding the daily total. How can I synchronize my phone with the website? The first and most important thing is to sign in on your phone (or iPad) and the website with the same MyNetDiary account name and password. Once you do that, anything you enter on your phone gets synced to the website immediately if you are online, or the next time MyNetDiary has internet connection if you are offline. Vice versa, everything you enter or update on the website will sync to the mobile app. If you have several of MyNetDiary's mobile apps, for example our app for Android and another app for iPad, they both will sync with the website and each other. If you already have the website open, to see updates from your phone you need to refresh the page. To see updates on the phone, you need to go to another day and then return, or open and close MyNetDiary. If you forgot or not sure about your account name, please see Forgotten account name or password support article. How can I get MyNetDiary on my smartphone or tablet? Please, see MyNetDiary Mobile Apps page. MyNetDiary's iPhone apps include a special app for Apple Watch. MyNetDiary's watch app is optimized for watchOS 2, to work faster and more reliably. Please make sure you have watchOS 2 installed on your Apple Watch! Here is the procedure in case you need to upgrade. Scroll to find the MyNetDiary app, and then tap it. Turn on Show App on Apple Watch. The following support article from Apple provides detailed instructions on app installation, managing glances and notifications: Use third-party apps on your Apple Watch. The Calories Chart shows how your daily calories actually affect your weight loss or gain. No matter what your weight loss plan is, or your weight loss plan customizations are, the Calories Chart compares your daily calories with your "daily maintenance calories" for that day, showing you the true picture of your weight loss progress. Daily Maintenance Calories are calculated based on your current weight, height, age, gender and activity level. As you lose weight, your Daily Maintenance Calories will be reduced, i.e. your body needs fewer calories. The Calories Chart shows this in colors. Calories less than your plan AND less than "maintenance" are shown in green. Calories more than planned, but still less than "maintenance" are shown in yellow. You are losing weight, but not sufficiently according to your plan. Calories above "maintenance" are displayed in red - you are gaining weight according to MyNetDiary's calculations! The horizontal line on this chart is your "maintenance" calories. As your weight changes, your maintenance calories would change, so this is not a strictly horizontal line! Once again, this line is not your "plan" line, it's your actual "maintenance" calories. Finally, if you do exercise, your daily calories are automatically reduced. Exercise always pays off! You may notice that your weigh-ins entered in MyNetDiary sometimes become 0.1 lb smaller or larger, not immediately, but a few hours later. 3. AND you enter weigh-ins in MyNetDiary. 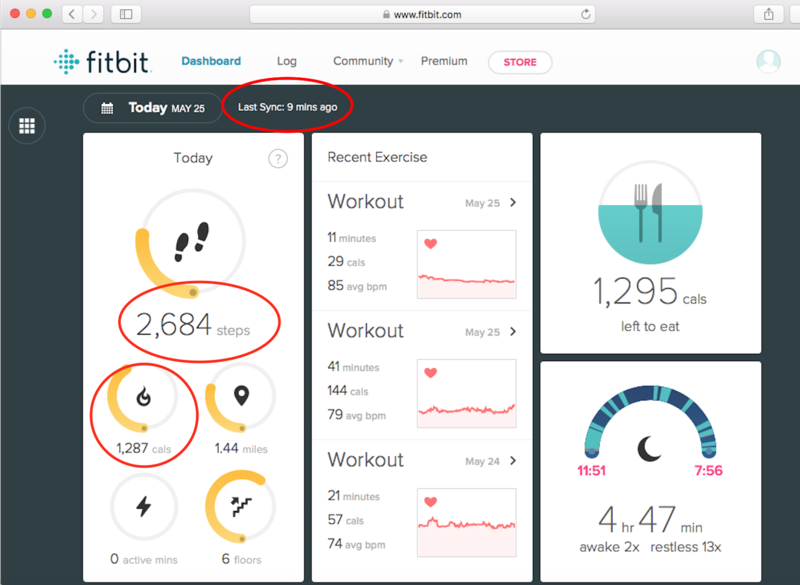 If this happens for you and you want to keep entering your weigh-ins in MyNetDiary while being linked to Fitbit, to avoid such issues you need to turn off weight load from Fitbit on MyNetDiary's Fitbit link page (or screen in a MyNetDiary's mobile app). Otherwise, due to rounding issues in Fitbit, some of the values entered will eventually get changed by 0.1 lb. Here is a more detailed explanation. For example, 346.2 lb entered in MyNetDiary is 157,033.865 grams. When sent to Fitbit during first sync, it is stored in Fitbit rounded to one digit after decimal point as 157.0 kg. When received from Fitbit during second sync, 157.0 kg is sent to MyNetDiary in lbs, which is 346.1252709 lb. When rounded to one digit after decimal point, this number becomes 346.1. Your weigh in entered in MyNetDiary as 346.2 becomes 346.1 after two syncs with Fitbit. If you don't hear reminder sounds or don't receive reminder notifications about meals, weigh-ins, BG measurements, you might have disabled notifications for MyNetDiary in your iPhone settings. To enable notifications, sounds, or change notification options, please go to the Settings app on your iPhone. Then, tap on the Notifications item in the list, find MyNetDiary in the list. Then, make sure notifications are enabled and choose notification options, such as showing them in Notification Center, sounds, Lock screen options and so on. If you have a Withings body scale and several members of your family use both the scale and MyNetDiary, then separate Withings accounts are needed to link with each MyNetDiary account. First, you need to sign in to the Withings website with the existing Withings account and then "make independent" other Withings scale users. Please see the screenshot below and follow Withing's instructions Making a User Profile Independent for detailed steps. Then make sure that each member of your family that has a MyNetDiary account is able to sign in to the Withings website with his or her newly created Withings account. Finally, each member of your family that was made "independent" and uses MyNetDiary has to link to his or her Withings account either from the Settings screen in MyNetDiary's mobile app, or from MyNetDiary website's Account/Withings tab. Sometimes, iPhone gets stuck on updating one or several apps - it shows a progress indicator, but it does not move. This does not happen often, but it happens for some people once in a while. Unfortunately, this problem is entirely on the iPhone/iOS side and we have no control over it. All app downloads, installs, and updates are handled by Apple's own App Store app. We only send our updated app to Apple once, from that point on, distribution and updates are handled by the App Store. We found the official support article from Apple on this issue: If you can't download or update apps, or if apps get stuck. Please try following these instructions. If this doesn't help, we recommend contacting Apple Support over a phone or setting an appointment at an Apple Store. Alternatively, if you have created an account with MyNetDiary (as the app had recommended), you can delete the stuck app from your phone, then download it directly from the App Store again, and then sign in into the app with your MyNetDiary account, which will restore all of your data from online backup. How can I find out my account name? In the iPhone and Android apps, you can see account name on the Settings screen, either under in the "MyNetDiary.com Account" section, or in the "Upload Log" line - if you have not created your own account yet. Also, if you have not created your own account yet, you can do this on this screen and then use the newly created account name to sign in online to the website. On the iPad, you can always see account name at the very bottom of the Settings screen, as "Sync queue name". If you already created your MyNetDiary account, it will be displayed on the MyNetDiary Account screen as well. On the website, you use it to sign in to MyNetDiary, it is also displayed if you go to the Account tab. Garmin's vivo activity tracker products tracks calories throughout the day. This includes calories burned as if at rest (BMR) as well as extra calories burned from being active. Garmin's fitness products only capture and display calories for being active. Calories can be viewed by users on Garmin Connect and these will correspond to what is captured and displayed by the devices. However, calories that Garmin Connect provides to integration partners such as MyNetDiary only include the calories burned associated with the given activity. They do not include BMR calories. So, Garmin calories displayed on Garmin Connect and in MyNetDiary will be different due to the way Garmin sends to its partners. In MyNetDiary, all nutrients are rounded for each food before adding them up to meal and day totals. All nutrients are rounded to the nearest integer value in this nutrient's units (grams, mg, or mcg), except for Thiamin, Riboflavin, Vitamin B-6, Vitamin B-12, Pantothenic Acid, Copper, and Manganese, which are rounded to one digit after the decimal point. We ended up with this approach after very careful consideration: while there is a loss of accuracy, it's not very significant, as 1) statistically, the more foods you have, the less average difference is, 2) due to the food label rounding rules, small nutrient values have 5-10% accuracy already (see section on rounding rules in Nutrition Labeling Manual), so the difference due to rounding is less or comparable with the difference due to food label rounding. On the other hand, this approach makes sure that all totals match up their parts and thus avoid inevitable confusion and doubts that something is calculated incorrectly when seeing that the sum of values in foods does not add up to the total displayed. My Tracker (Fitbit, Garmin, Withings) does not sync! Tracker vendors provide access to tracker data via their websites. Each kind of tracker or body scale, being it Fitbit, Garmin, or Withings, has to upload first its data to its website, such as www.fitbit.com, or www.garmin.com, and so on. Next, MyNetDiary website periodically downloads data from the tracker websites. After the data is downloaded, it's displayed in your online diary at www.mynetdiary.com and also sent to MyNetDiary's mobile apps. As you can see, it's a complex, multi-step process, with many moving parts, so there are many things that could go wrong. If you don't see the data downloaded in your online diary or in your MyNetDiary mobile app, please check first that your tracker has uploaded data to its website. For example, for Fitbit you need to go to www.fitbit.com with your internet browser. It's important to use a browser, not Fitbit's mobile app, because even if the app has the latest data, it might have not been uploaded to www.fitbit.com. So, please use the browser and login with your Fitbit account name and password and check what you see on your Fitbit Dashboard. It should display daily steps and recent sync time, something like the screenshot below. If there was no recent sync on the tracker website, you need to sync your tracker first. If there was a recent sync, then please check link status page or link status screen in MyNetDiary mobile app. A sync with the vendor's website could be already scheduled in MyNetDiary, so the data should arrive then. If the link is disconnected, please reconnect again. If after these checks you are still having problems with sync or something does not work right, please send us a support request, we will be glad to help you. We found a problem using MyNetDiary app for Apple Watch when the iPhone is locked and the MyNetDiary app for iPhone is not running. The symptoms may include water glasses not being updated and other errors. This issue is due to iOS protecting MyNetDiary files until you unlock iPhone and launch the app so that no other app cannot get to your data. Unfortunately, with the Watch app relying on files to transfer information back and forth, this results in errors. We are working on a solution now, and, we are planning to release a brand new Apple watch app in January-2019. In the meantime, the Watch app will reliably only when iPhone is unlocked and MyNetDiary iPhone app was already launched. We apologize for the problem. My Tracker (Fitbit, Garmin, Withings) reduces available calories after sync! This is a quite possible scenario - calories available change based on how much you move and using an activity tracker is the best way to accurately estimate and adjust available calories, to make sure you eat less than you spend and thus you lose weight. Please read on! We will use Fitbit as an example, but this is applicable to any wearable activity tracker. 1. MyNetDiary over the course of a day absent Fitbit sync estimates your daily calorie expenditures per "Sedentary" activity level, which includes some typical daily chores, walking, etc. For example, your estimated calorie expenditures (which also depend your current weight, height, age, and gender) could be 2,500, so if you plan to lose 1 lb/week, you need 500 calories deficit per day, i.e. consume 2,000 calorie per day, and if you ate only 1,800 you would have 200 calories available. In this example, 2,500 calories is the best estimate available of how many calories you've spent for the day (MyNetDiary does not have any other information). 2. On the other hand, your basal metabolic rate (when you are not moving) could be 1,600 calories. So, depending on how much you move and exercise on some day, your calorie expenditures could be 1,600 and up. Could be 1,700 calories, could be 2,500, or 3,000 and so on. A wearable tracker is meant to calculate and register your accurate calorie expenditure, whether it is lower or higher than the typical average estimate. 3. If you were active and did exercise, you can easily spend more that the typical estimated "sedentary" calories, e.g. spend 3,000 calories, so when you sync your Fitbit and this information arrives to MyNetDiary, your available calories will be increased by 500 (that is 3,000 - 2,500 estimate). 4. BUT, if were not active on this day and barely walked around, Fitbit may calculate your daily expenditures as e.g. 2,150, which is 350 calories fewer than the 2,500 calories estimate. In this case, when you sync your Fitbit and this information arrives to MyNetDiary, your available calories will be decreased by 350 (that is 2,500 - 2,150). In this example, if you ate 1,800 calories and spent 2,150 calories, you calorie deficit is only 350 calories, i.e. you are 150 calories over your planned 500 calories deficit! You are still losing weight, but not as fast as planned. If you weren't using an activity tracker you'd be unaware that your calorie deficit is less than planned, that you need to be more active, or you need to eat a bit less if you are not active. If you used MyNetDiary before, but you don't remember your password, you can reset it online at Password Assistance page. A password reset link will be sent to the e-mail address of this account. If you don't receive this e-mail after a few minutes, please check your junk mail folder. If you don't receive this e-mail at all, most likely account name or e-mail address you entered is not right (do you have another e-mail account? ), please try a password reset again making sure the name is right. If you haven't provided e-mail while setting up your MyNetDiary account, or skipped account creation in a mobile app, unfortunately, there would be no way to reset the password. You can create a new account and start fresh. MyNetDiary will keep working for you as well as before. The most important thing is to keep tracking, eat better, get active and MyNetDiary will help you achieve your goals. MyNetDiary can help you lose weight faster with meal reminders and notifications. To make sure you get reminders at the time you selected, MyNetDiary mobile apps sync your current phone's time offset from UTC, so that MyNetDiary servers can correctly calculate time to send you reminders even if you travel or you go on Daylight Saving time. MyNetDiary stores your current offset from UTC, which varies for standard and daylight time. For example, if you are located in the US Eastern timezone, your UTC offset will be -5 hours during Standard (winter) time period, and -4 hours during Daylight Saving (summer) time period. Thus, MyNetDiary Settings page will automatically display for you "(UTC-5) Eastern/Central Daylight" during Standard time, and "(UTC-4) Atlantic/Eastern Daylight" during Daylight Saving time period. If you change offset manually on the website and then you use MyNetDiary mobile app from a phone that has a different UTC offset at the moment, offset on the website will be updated automatically. We've added several new charts to the Home screen to let you see more information at a glance. We call it Dashboard and we hope you like it! We also know that one size does not fit all - you can customize the Home screen the way you like it - move items around, remove items you don't need, and even switch back to the old Home screen! To customize the Home screen, please use the "gear" button at the bottom of the Home screen. On the popup menu, you can also select "Dashboard Selection" (to choose from pre-configured options). Or, you can tap "Dashboard Personalization" to customize Home screen as you wish. Just tap, hold and drag the particular tab to desired place (to Dashboard, to Upper-Left-Popup Menu, or to Inactive-Items section). You can also change colors to more contrast on the Settings screen of the app. Most colors will change at once, but some will change only after app restart. We do hope this helps to make MyNetDiary look and work exactly as you want it, to help you achieve your diet goals! For technical problems, the "Exercise" tab was not appearing in the "Classic" type of the Home screen after ver.6.86 update. We regret any inconvenience that might have caused. The issue has been fixed on the ver.6.87. Please make sure you are using the latest version of the App. I have a BlackBerry 10 phone, can I use MyNetDiary on it? Yes, you can! While MyNetDiary has not yet released a special version for BlackBerry 10, BlackBerry 10 phones can run Android applications and MyNetDiary for Android works with it. In recent updates of iPhone and Android apps, there was a small change in the way of selecting servings. Previously, if you have entered a number (for example "1.5") and then tapped one of the previous inputs on the right (for example "2.5 cup"), the app would keep the number and assign serving type from the previous input tapped ("1.5" would become "1.5 cup" in this example). We've spent a lot of time experimenting and polishing the app, including formal usability testing and found out that this behavior is confusing and not obvious for about 83% of people. The majority expects to see on selection exactly what they have tapped ("2.5 cup" in this example). So, we had to change this app behavior, to make it simpler and less confusing for the majority. The challenge was to provide an easy way to select serving type after typing amount for our long-time users who are accustomed to the old way. To achieve that, we simplified the serving list, eliminating any numbers from servings other than previous servings, while ensuring that all possible serving types are always available. 1. If you need the previously used value and serving combination, you tap it and it's entered. Now it works the same way consistently, regardless of what is entered in the amount box. The old way when tapping on a previous entry only changes units feels not logical and unexpected - in apps, if you tap on something, the whole gets selected, not just a part of it. 2. If you typed the number e.g. "2.5" and need to enter "cup" from the list on the right, you still need just one tap to select this serving type as before, only instead of (non-obvious) option to tap some previous input with a different number of cups, now you would tap the "cup" option without numbers. It is still just one tap, no extra taps needed! We hope you see the logic behind the change. We always strive to find a good compromise. Recent amounts suggestions, like food suggestions, are managed automatically. The most recent and most frequent amounts will show up at the top of the list, letting you enter repeated amounts quickly. MyNetDiary shows up to 5 such amounts. If you made a mistake or don't want to see some specific amount, you don't need to do anything special, just keep entering the amounts you eat and they will replace old, no longer used amounts. When the barcode is scanned, but the food name you see is not right, do not tap the "Use" button, tap "Cancel" button instead. Then, try searching by typing the correct food name. Log the food to your meal. MyNetDiary will remember that this UPC is associated with the food you just added. The next time you scan the same barcode, the scanner will find this food. If you cannot find the food searching by food name, please create your own custom food and link UPC to it. Many people use MyNetDiary on a smartphone, when typos are common. MyNetDiary tries to be proactive and correct typical food name misspellings, even while you type. For example, "straqb" is corrected to "strawb", "sandqi" - to "sandwi", and so on. Sometimes such corrections may be doing the wrong thing - if you are not using English language or have a food with unusual name spelling. If you are using another language, you can turn this spellchecking off in MyNetDiary Settings. If it's an unusually spelled food name - please let us know and we will remove this auto-correction the next day. If you upgraded or re-installed the MyNetDiary app recently, most likely you did not "sign in" with your existing MyNetDiary account name, but created a new account, so no existing data shows up in the mobile app. The most important thing is to make sure you do "Sign In" and use the same MyNetDiary account name as before! If you have created a MyNetDiary account when you started using the app initially, you can sign in with the same account name and password. To do that, you should have created the account initially (the app strongly suggests doing this during setup - for backup and recovery purposes.) If you still have the old app, you can open it and create a MyNetDiary account now, from the MyNetDiary Settings screen. If you haven't created a MyNetDiary account initially and don't have the old app, unfortunately, there is no way to access and use your old data. 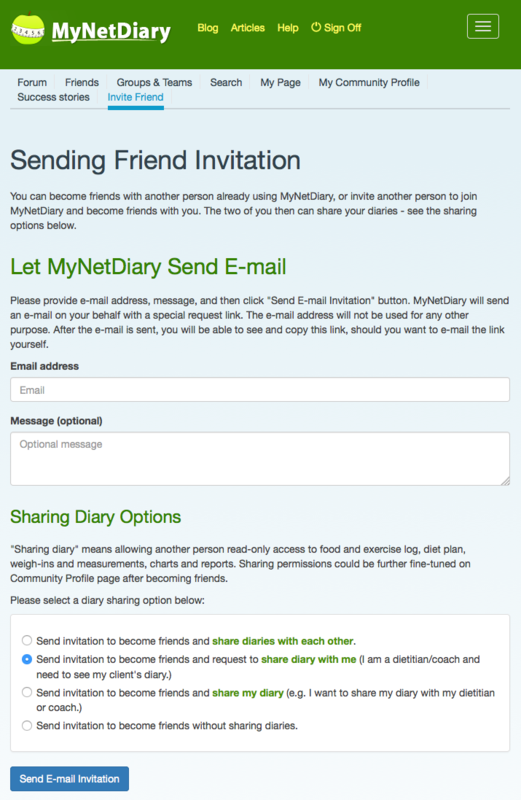 Once you have your old account name and password ready, you can "sign in" to MyNetDiary. If you installed the app fresh and did not sign in to your old account while setting up the app, you can do this from the app's Settings screen. If you are asked whether to use current phone data or delete them and use your old data, please choose your old data. Or, you can simply delete and re-install the app, choosing the "Sign In" option during setup. We would like to remind that MyNetDiary account is not the same as your Apple ID or Google account (although you may choose to use the same name in both places) and it is recommended to use different passwords. After I delete and reinstall the app, will all my data from the website sync back to the app on my phone? Yes. If you see your data on the website, it will be uploaded back after re-installing the app. Just make sure you select "Sign In" option when you open app again. Then, enter the same credentials (MyNetDiary Account name and the password) as on the website. Is the only way to view a friend's food log through the web browser? I downloaded the mobile app hoping it give me the ability to see this but it seems I can only view this on the web browser. Is viewing this through the app a feature of Maximum? This option is available via our website. 3. search the copied item from your diary, in the same way as you search for the regular foods from our database. 4. view friend's reports and charts via his/her Personal Page in MyNetDiary Community. Users without Maximum membership can share only Food Report for the recent week and Weight Chart for the last month. I sync exercise from another activity tracker, but they do not subtract my normal calorie burn. Am I double-counting those calories? Does MyNetDiary automatically subtract background calories from exercise calories? MyNetDiary uses the Institute of Medicine energy equation. The IOM equations include activity levels. Most other trackers are using just the basal metabolic rate estimate from Mifflin-St.Jeor so their estimates will be lower than MyNetDiary. The way MyNetDiary integrated with the other trackers is likely overestimating the total energy expenditure. We are discussing a more meaningful way to integrate MyNetDiary with them. You may also find it useful to review our in-depth Calorie planning guide. Can I back up my data if I skipped creation of the account? Yes. You can create an account via the Settings screen of the mobile app. Then, sign in with the same username to www.MyNetDiary.com website to see the mobile app's data stored on our servers. How to print my Notes? You can print notes from Analysis > Multi-Day Reports > Notes Summary page. I sent the photos of Nutrition Facts and Package Front, but food is not updated. Typically, we update nutrition facts during 24 hours. If nutrition facts are not updated, please search for the similar food name. There is a chance we slightly corrected the food name (according to the photos sent). Otherwise, photofood "Status: Uploaded" has to be changed to some rejection reason. Please look up the details of the food from where you submitted your request. You may see some advice or solution (like "Sent photo is not clear. Please retake. ", "Sent photo does not match selected food", "Food already exists. Please search again by typing its name." or so on). Note: Updating the nutrition facts is slightly different from assigning of the barcodes. Please do not send us PhotoFood request if scanner finds the item with the name different to the name printed on the real package. In this case, simply re-assign the barcode to the right item. Can't use barcode because of "Libraries aren't available" error. Our barcode scanner feature uses the Google's libraries. This library is not a part of our app. It's a part of Google Services App built into your Android device. Usually, they are downloaded by the system automatically, but, in some cases, they are not. If you see a message that "The barcode libraries aren't available. Google Services Apps have to be updated" that means the system can't download them. The issue with Google Services Apps update can be caused by spotty Internet connection on your device. Or, your device is not having sufficient storage space for that update. If you checked Internet connection and it is working, please clean the storage space on your device and try using MyNetDiary App again. The barcode libraries have to be downloaded immediately after you try barcode scanner again. Most of us have to use sedentary activity level - that includes basic activities of daily living, including incidental walking up to about a mile or so (about 15-20 minutes of walking.) Then, only log exercise above and beyond the activity level. This avoids the problem of double-counting exercise calories. We would suggest this article - it will help you learn more about how calories are calculated and which settings affect the targets. The exercise plan section can be especially helpful. My Plan item has "Please Review" on the Home screen! MyNetDiary keeps track of your plan and let's you know when you may need to review and adjust your plan. Your target date is in the past. You lost a lot of weight and your body needs fewer calories, and now your current calorie target is too high to achieve your plan on your target date. In either case, if you see "Please review" next to your plan, simply go to My Plan screen and update your plan. It's simple with MyNetDiary!